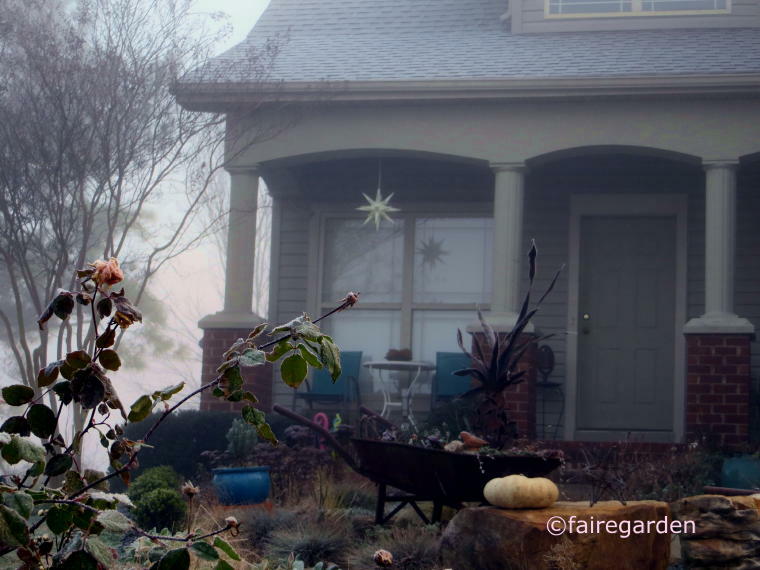 It was a frosty and foggy morning. 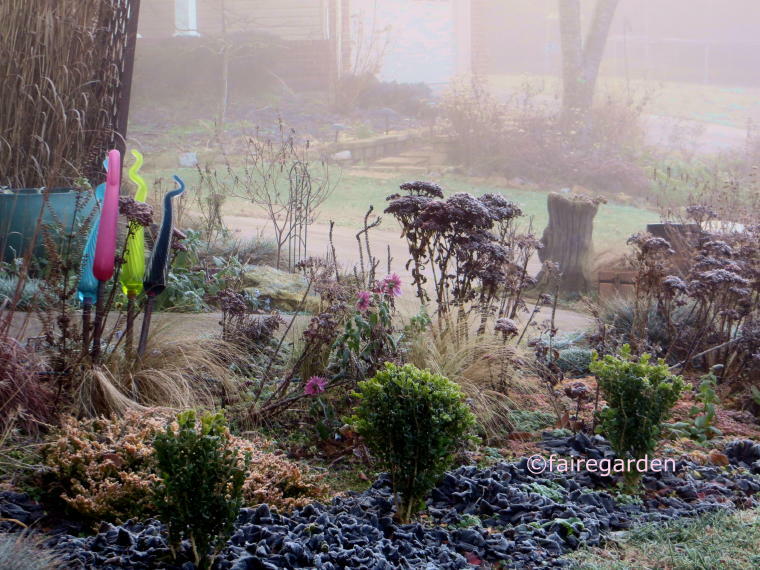 The garden was particularly fetching in glittery sparkles. There was winter interest. 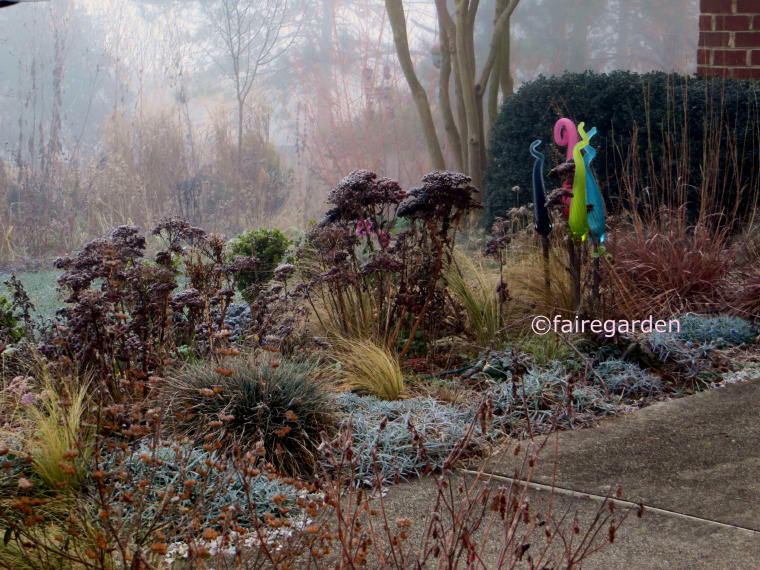 Winter interest can be defined as anything that pleases the eye, be it colorful foliage, interesting shapes and textures or good tonal contrast in the garden and beyond. 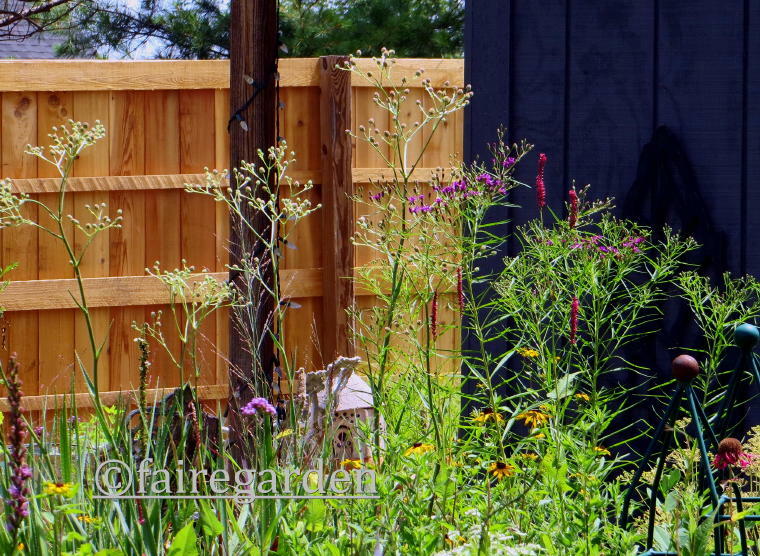 In its fourth year now, the Fairegarden is maturing. Nearly constant tweaking, trimming, moving and rethinking has been ongoing whilst the plants have been steadily growing on. The lawn/,meadow is filling in with self sown volunteers and a variety of small trees, shrubs, perennials and groundcovers that are sorting themselves out. I step in when necessary to edit, but leave it be to see what develops. Salix brizensis is coppiced yearly to provide long spindly twigs that wave in the westerly winds. Winter is their season to shine. 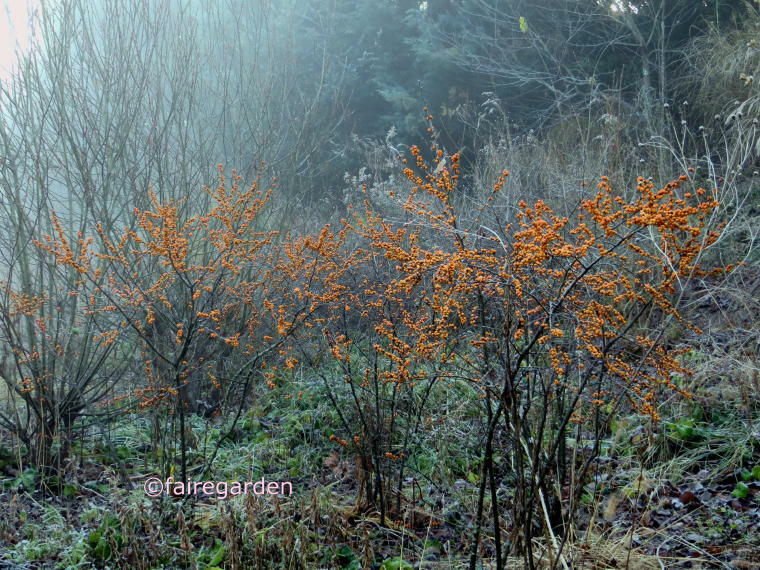 Winterberry hollies, Ilex verticillata ‘Winter Gold’ and I. 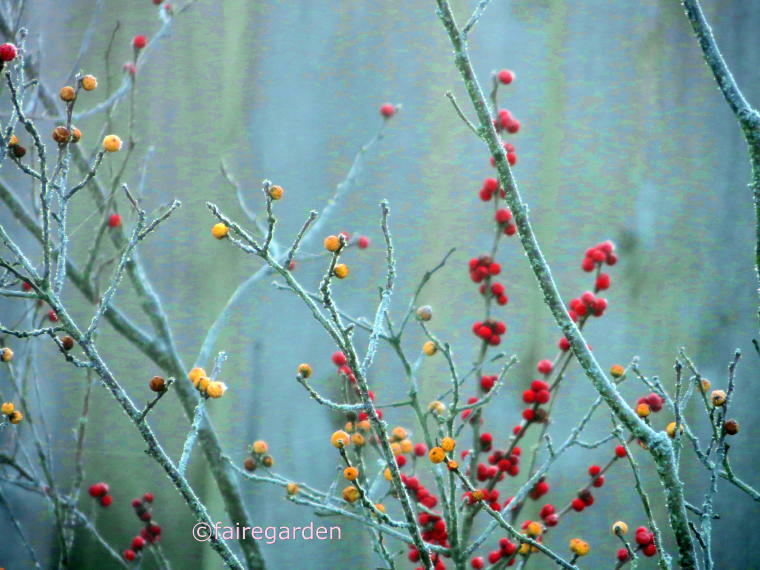 ‘Winter Red’ offer not only visual interest but also food for hungry birds. The mix of red and gold berries shows up better than the gold alone, although those are still fabulous. 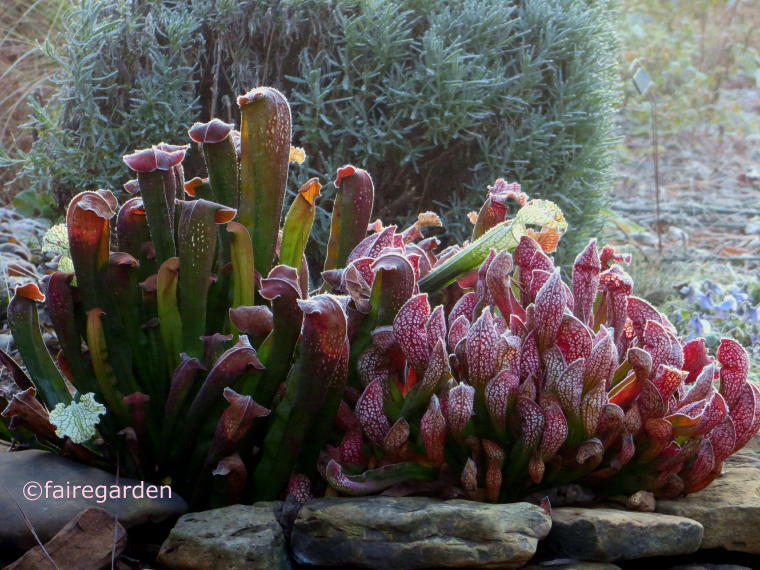 The carnivorous bog garden has filled in nicely. These pitcher plants, various Sarracenia sp. 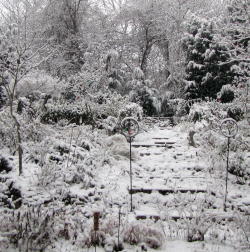 are winter hardy and will be cut down in late winter for fresh new growth. They remain colorful well into the new year. Concrete projects from years gone by are solid soldiers and rearranged on the regular. 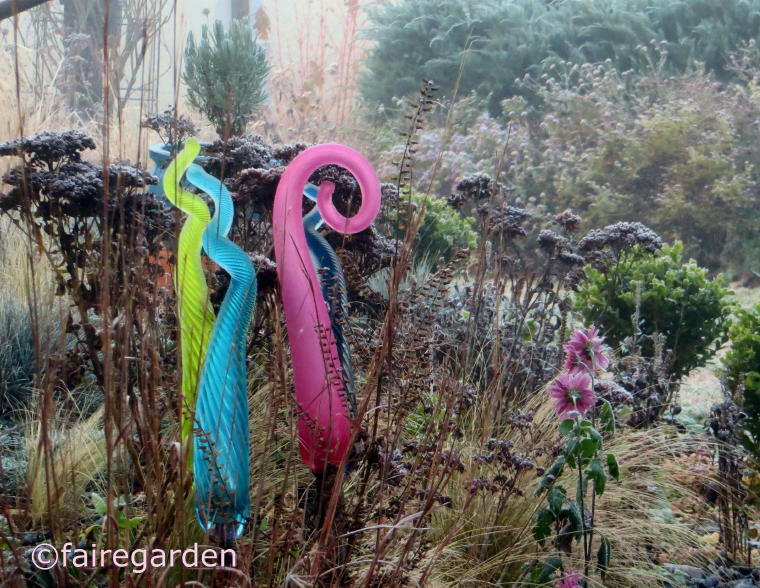 Glass art also is shifted from site to site until it finds its niche. 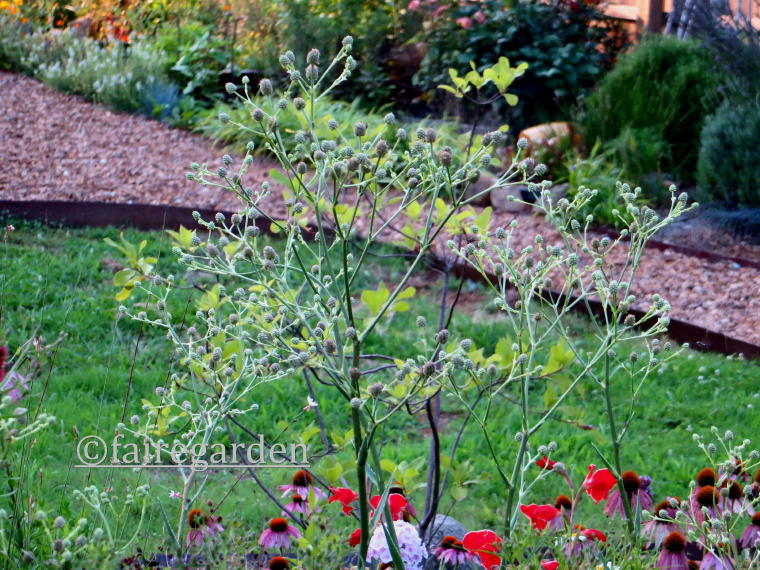 Hydrangea quercifolia ‘Little Honey’, on the left seems happy. The same cannot be said for the H. macrophyllas on the right. They have gotten zapped by late cold snaps every year. Maybe 2019 will break the non-blooming streak. The stems are still shapely and contrast well with the lighter browns and tans of this shady bed. 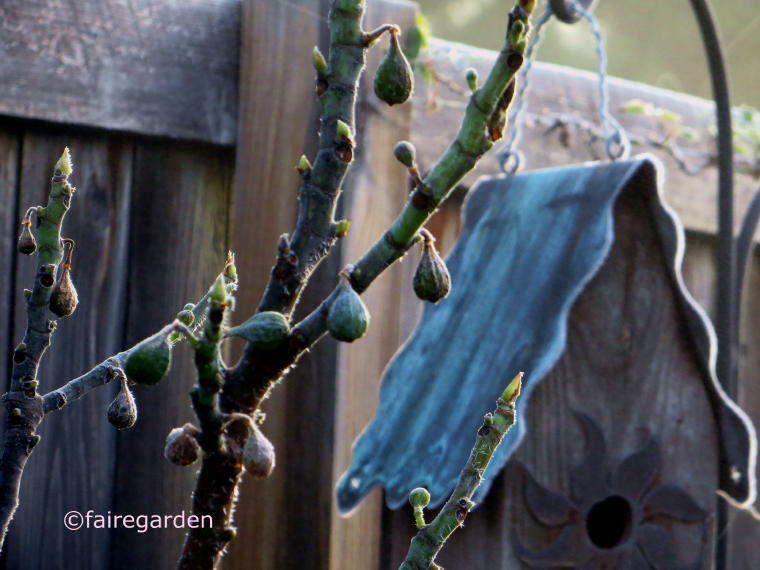 Frozen figs hang like ornaments. The fog is lifting now. The door of a new day opens, with a promise of good things to come. May the days be filled with love and joy for you, dear readers, as the end of 2018 nears and let their be hope for the future for us all. Now that October has rolled steadfastly into our consciousness, it is time for the Fairegarden to bid adieu to the flowers of 2017. It’s been a good year overall, as the floral display has evolved through the months. We are at the end now, soon it will be less colorful and more somber. But not just yet, for the finale holds brilliant displays with a long goodbye. 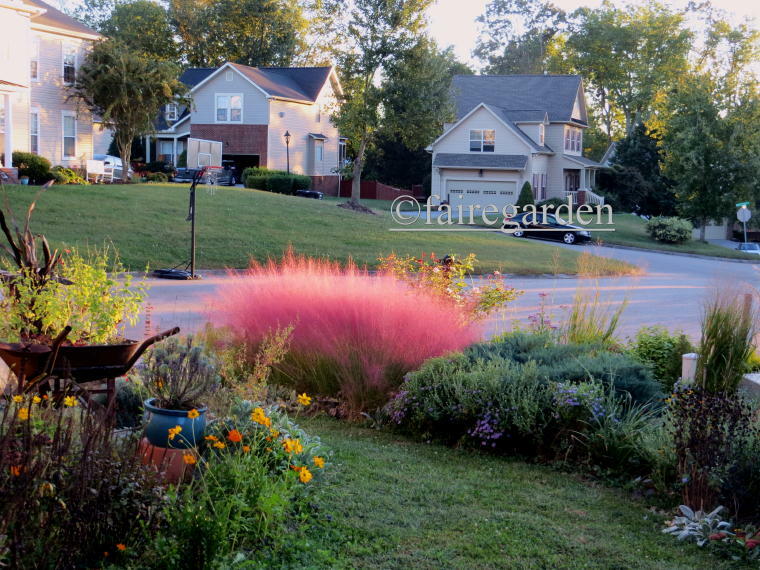 The most spectacular is the pink cloud of muhly grass, Muhlenbergia capillaris. 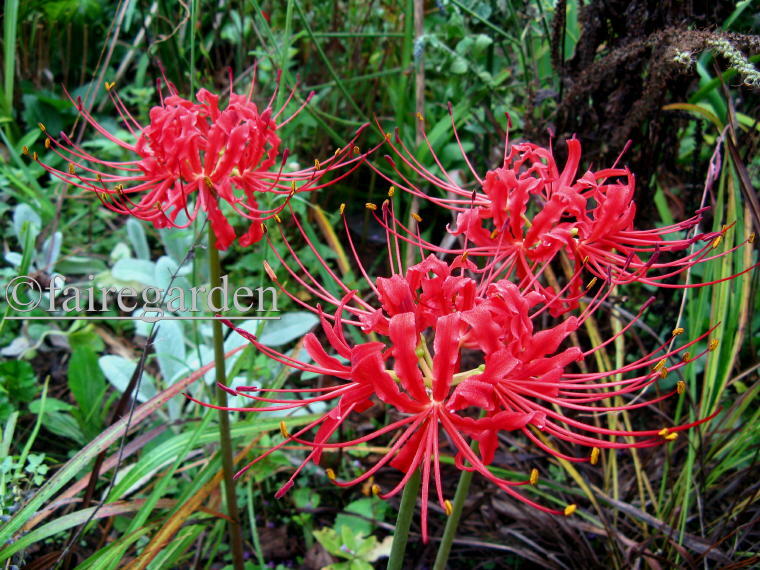 Short bloom time does not diminish the late blooming nakedness, sans leaves, of Lycoris radiata, spider lilies. This is the first year for these, three bulbs out of five emerging. 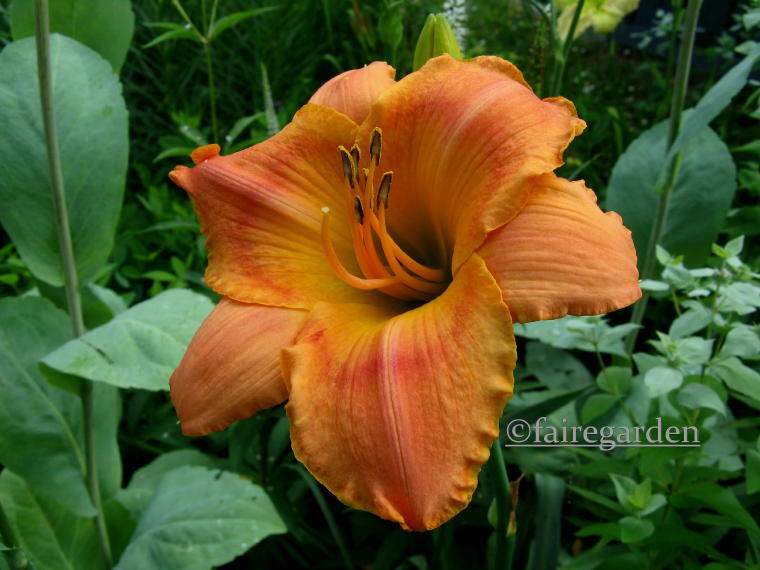 One other that was brought from the old garden bloomed several weeks earlier and about a foot taller. It has the same red flowers. We shall see if the newer ones change habit as they mature. Gardening is always full of surprises. Take notes, there will be a test. 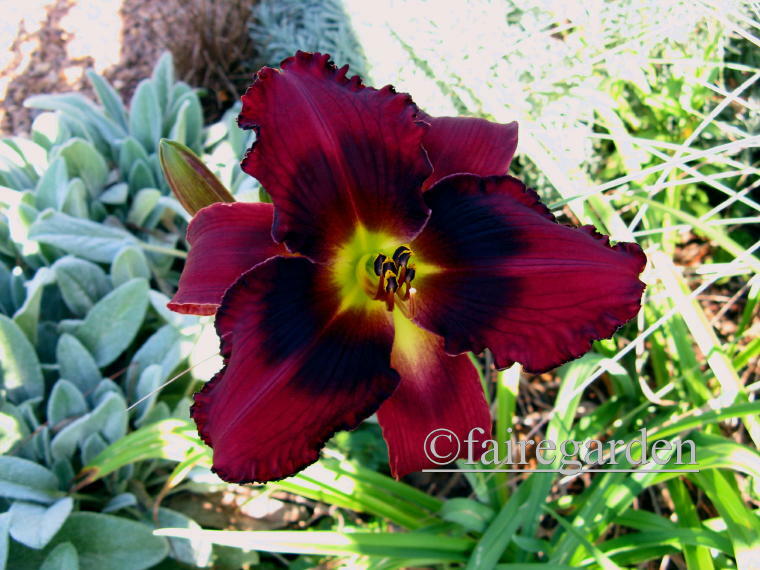 Very surprising is this reblooming daylily, Hemerocallis ‘Buddy’s Black Jack’. It first opened on May 27th and for some reason decided to give it another go now. Okay, you do you, Buddy. 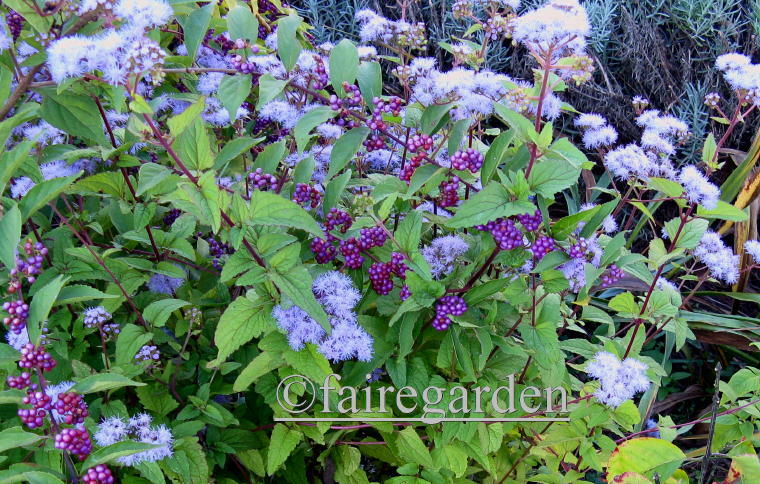 A combination that was admired along shady roadsides when we lived in Texas was beautyberry and wild ageratum entwined to showcase cool hues of blue and purple. Ours is Callicarpa ‘Early Amethyst’ and a truly wild, naturally occurring ageratum that was brought from the old garden. 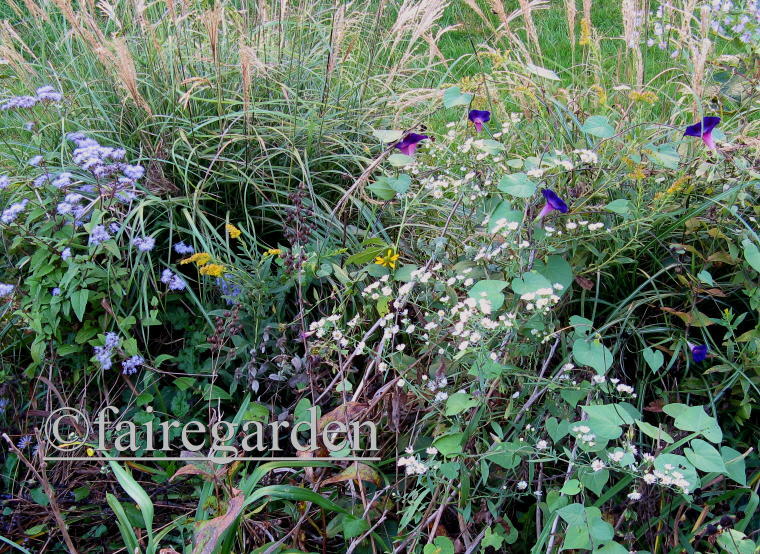 I can’t keep up with the name changes on this, (and many others plants), so will leave it at the common name here. 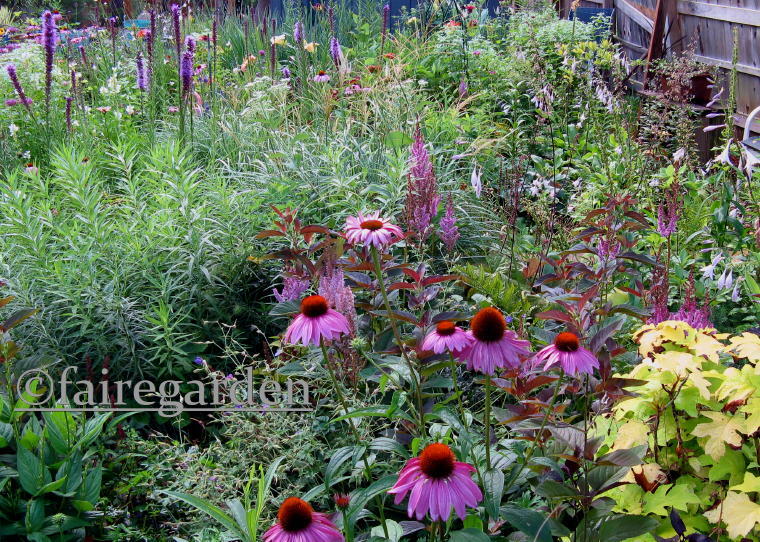 Speaking of the old garden, sigh, it was a very different landscape from this new one. First and foremost, the siting of it offered views with no other houses due to a steep upward slope out the back and empty lots all around. The new place is in a typical suburban subdivision. It lacks mature trees and the houses are quite squeezed in together. But that’s fine, life is about compromises. 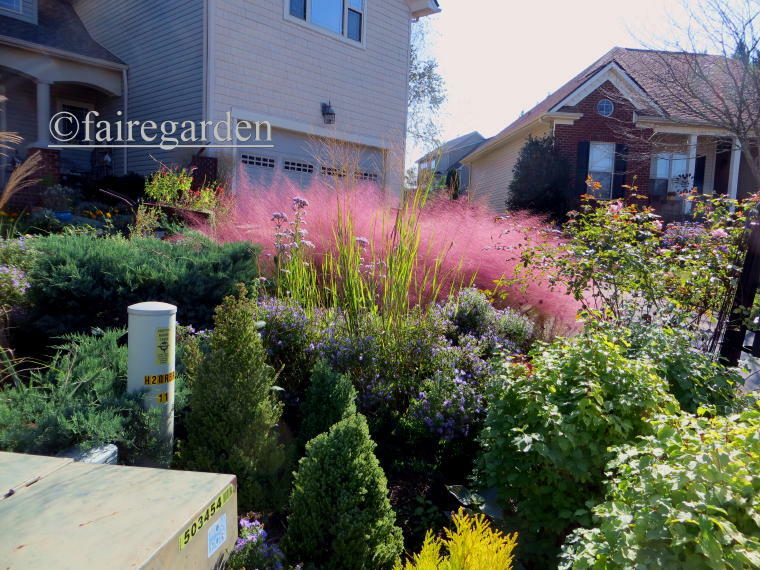 Anyway, sorry for the lost train of thought, here is a view from the next door neighbor’s driveway of the mailbox bed, showing how the pink muhly is a shining star in fall. Most of the morning glories were pulled in the lawn/meadow to prevent complete carpeting of surrounding shrubs, grasses and wildflowers. But some will always be left to grow and reseed, I love them so much. 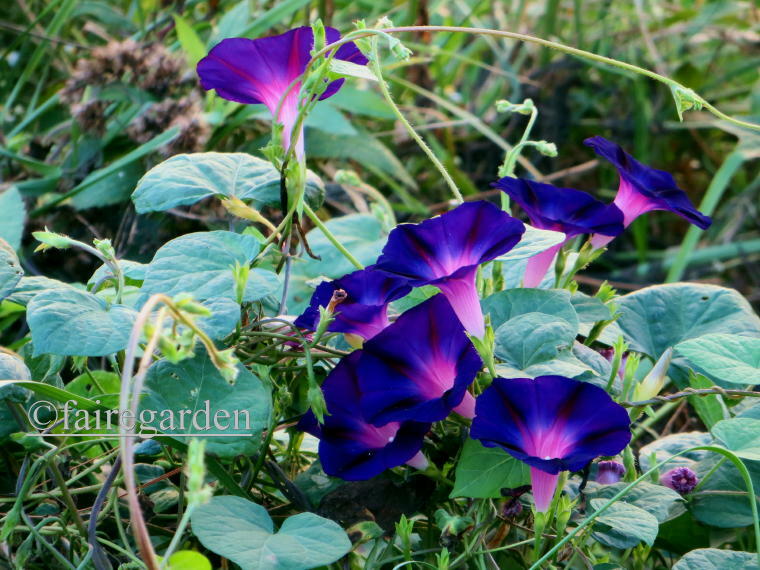 They are sublime in their hints of magical realms and hidden secrets and will always be part of my garden. Even as splashes of late color enliven the gardens, the quiet beauty of death and dying is gradually taking over. 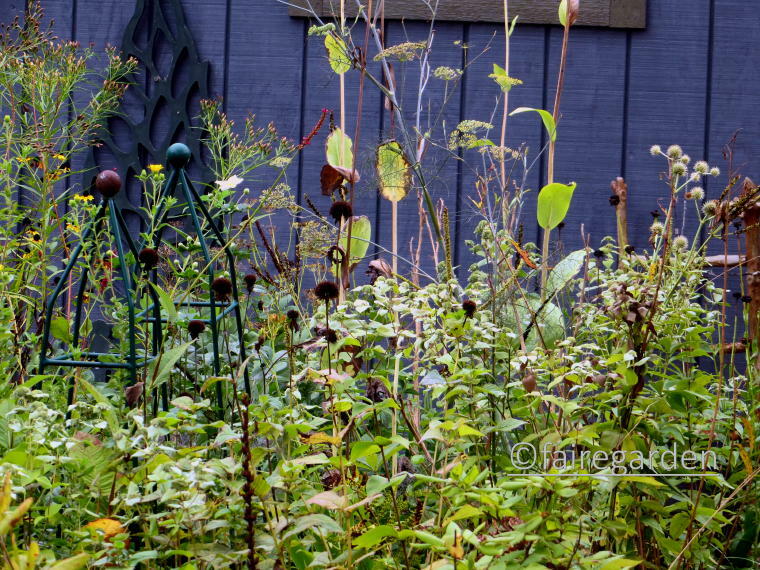 Great thought and effort has gone into creating pleasing textures that will last into winter from the browns and tans of spent seed heads and still standing stems. 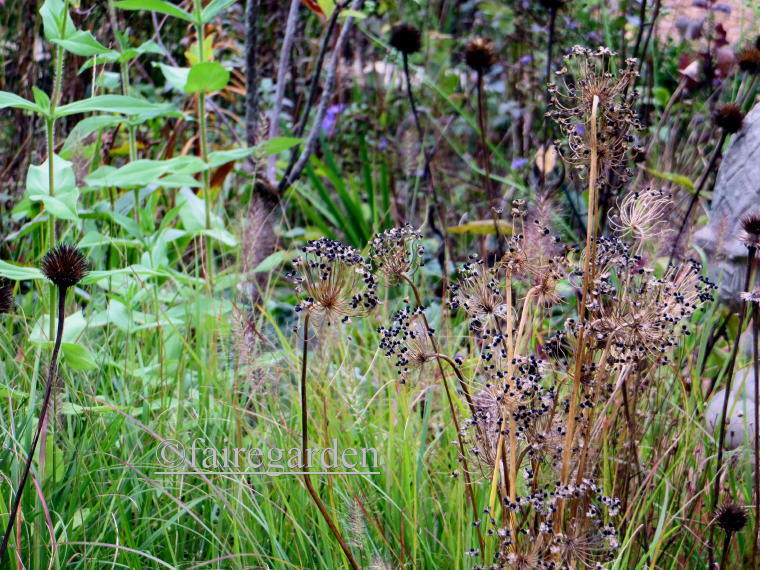 The black seeds contrast well in the fading Allium cernuum. Seeds were saved and scattered here and have reached blooming maturity. There will be more spreading. 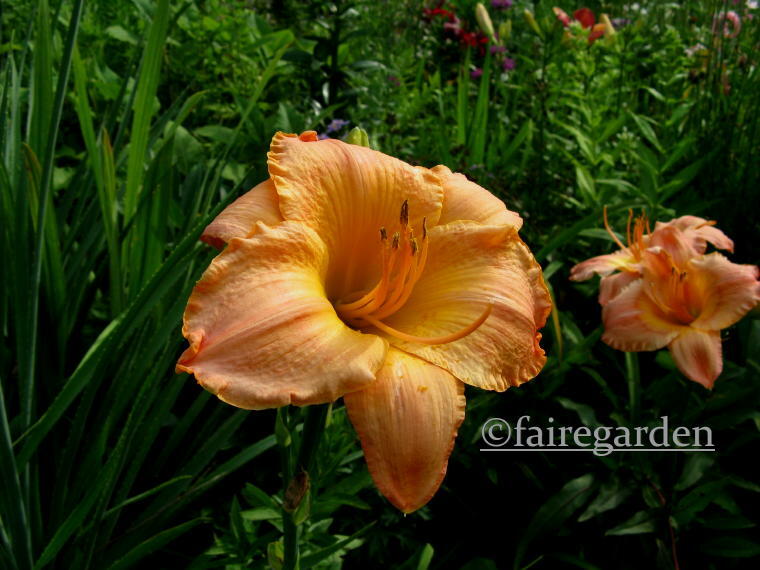 The short stature makes for a fine front of the border focal point. Creatures are in abundance now, finding sustenance and cover in a wildish garden. A seed packet of Zinnia ‘Benary Giant Dark Red’ has produced above and beyond expectation. They are quite tall, several over five feet and had to be staked. 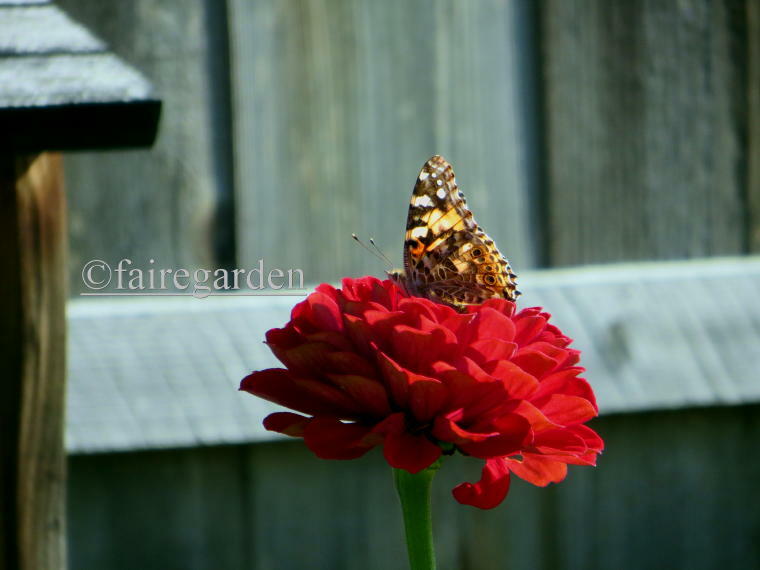 They are a favorite of the butterflies and the relaxing on the patio with a cold beverage gardener. 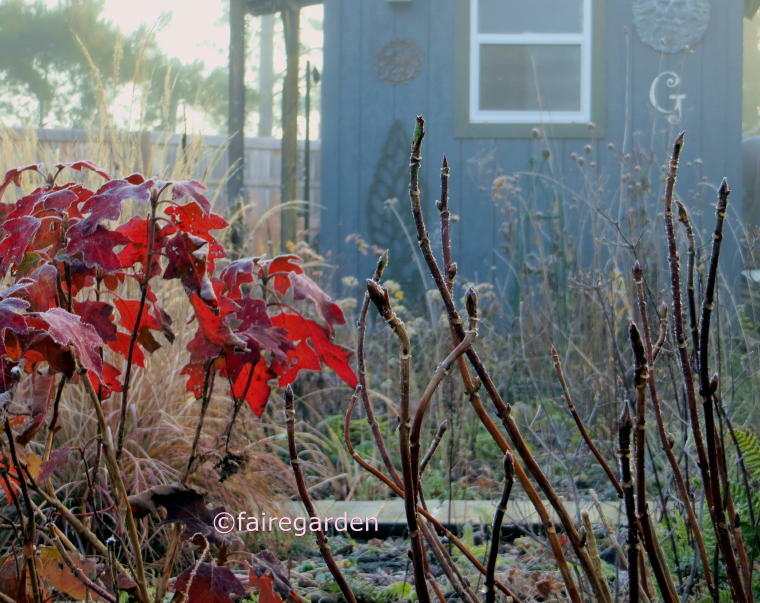 Garden art stands out as the light shifts its angle against the drying foliage. 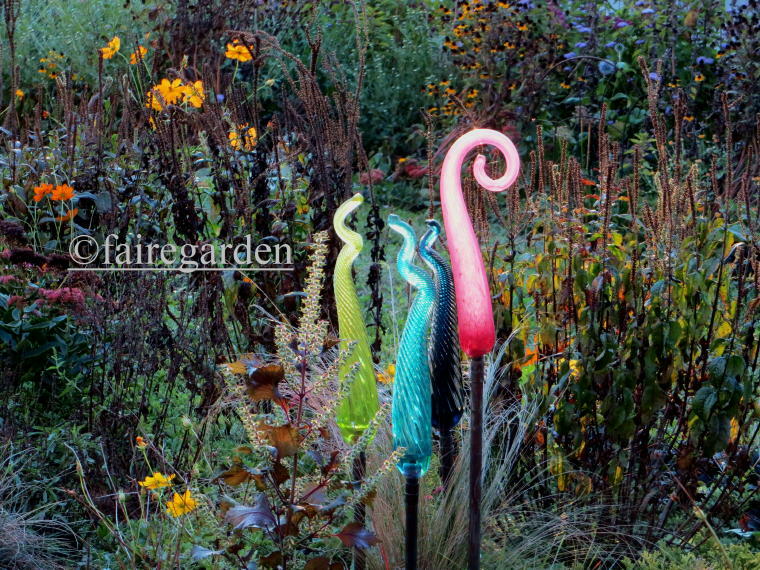 I have a lot, too much garden art and am still moving things around to best effect. This grouping seems to work. This is the unadulterated non-cropped image from the front porch, including other houses, cars, heavily used basketball goal, utility boxes and stop signs. But those things are not what I see when gazing out into the yard. 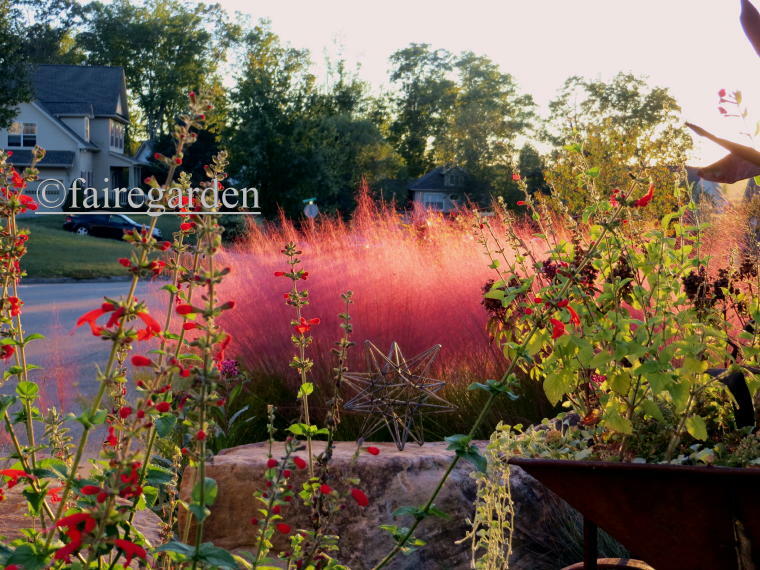 At the moment, the pink muhly grass is attention grabbing in the setting sun and will continue to be so for a couple of months more as the pink turns to pale purple and finally to light toast. Evergreens help keep the monotony of browns interesting. Fall will finish with a final flash of mums and deciduous leaf changing. Winter is coming, true, but spring will be right behind showing the payoff of the hundreds of bulbs that were ordered and will be planted soon. I can’t wait. 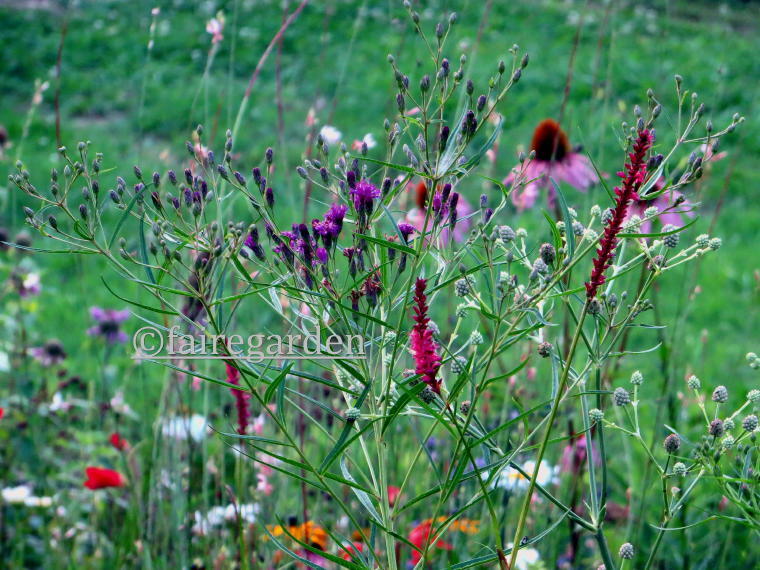 Late summer into fall can be a bit of a drag, gardenwise. 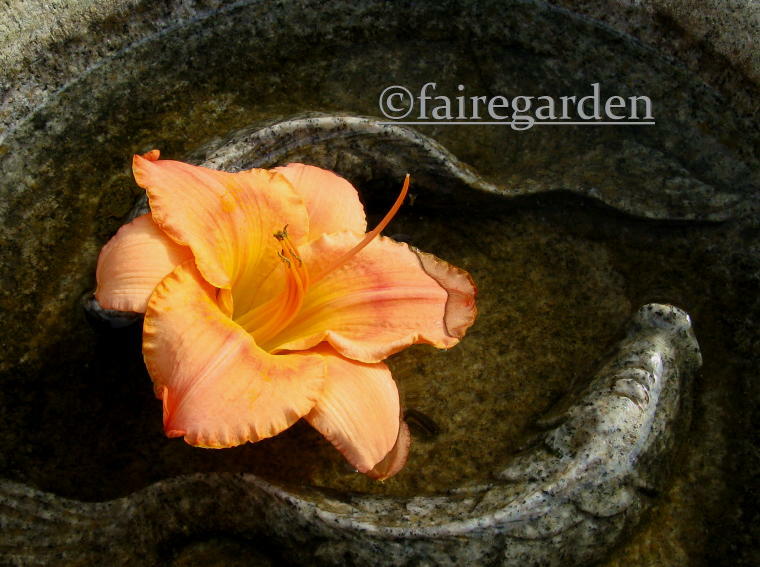 The freshness of spring is long past, the exuberance of summer flowers like daylilies have faded. We are left with brownish spent stems and leaf edges burnt by the heat and dryness that is characteristic of the middle of the year . But there has been a turning, little by little. 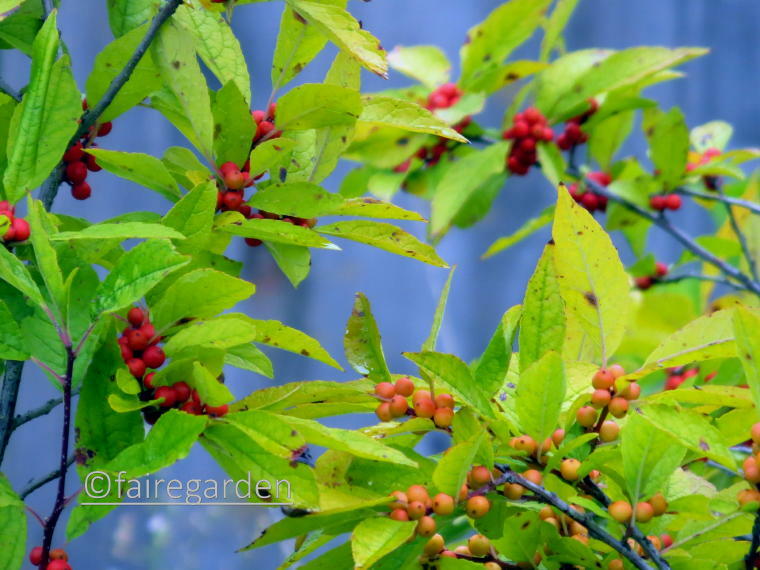 It is evident in the coloring of the winterberry hollies, Ilex verticillata ‘Winter Red’ and I. ‘Winter Gold’. 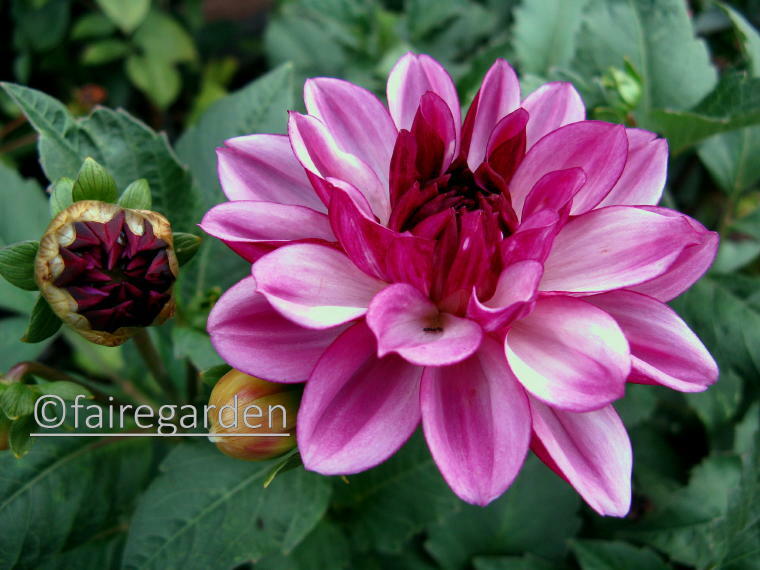 Certain stalwarts of hot conditions, with extra watering, are the Dahlias, including the eye catching D. ‘Creme de Cassis’. Let us zoom out some, to give a more realistic view. It is slightly controled chaos from a distance, but let’s take a closer look. Aha, my favorite little munchers, the larval stage of beloved butterflies. Tiger and black swallowtails abound here, due to the conscious planting of their favorite meal. 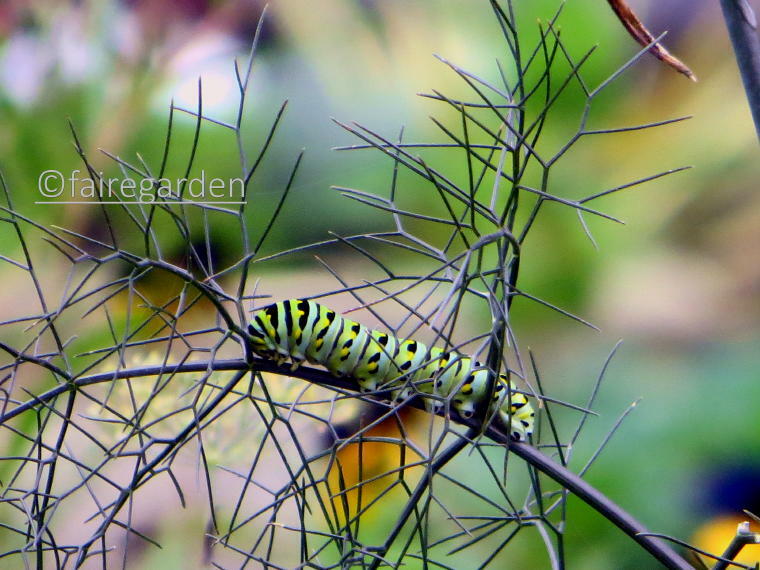 Parsley, dill and the very ornamental bronze fennel, Foeniculum vulgare are happily shared with very hungry caterpillars. We make sure there are plenty of nectar rich wildflowers for our flighty friends. 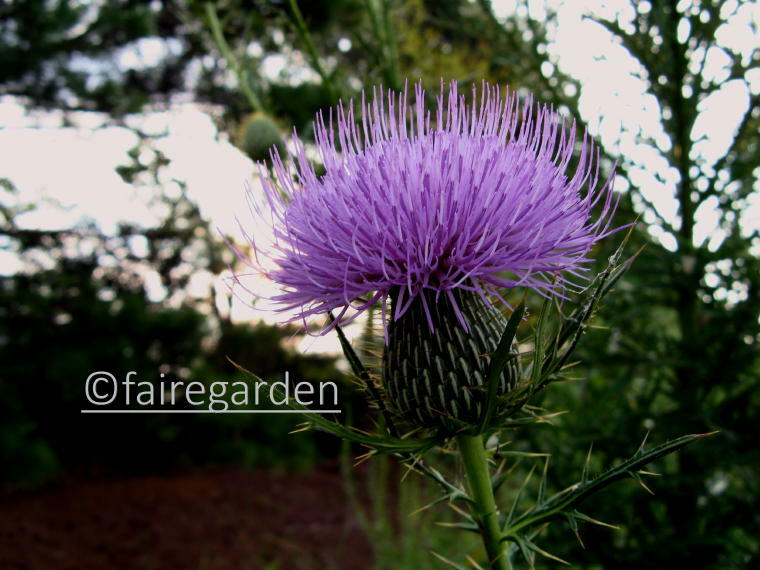 This volunteer thistle (unknown species), easily over eight feet tall, is a welcome giant in the lawn meadow. A black swallowtail can be seen in silhoutte against the strident summer sun, just above my watermark. The blossoms are architecturally beautiful, if quite pickery to the touch. Grasses in bloom enter the spotlight, adding movement and feathery touches. 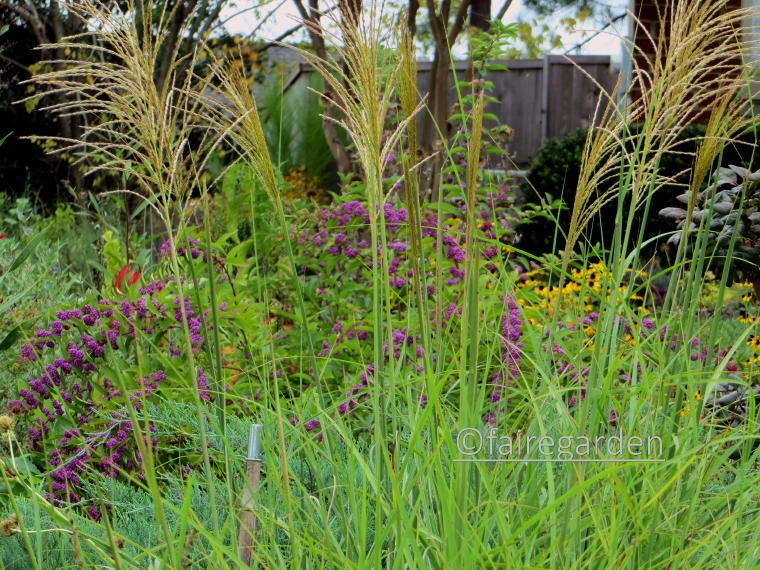 Miscanthus ‘Morning Light’ is a large presence, planted to help hide the utility boxes in front. It offers a glimpse of something more brilliant hiding behind. 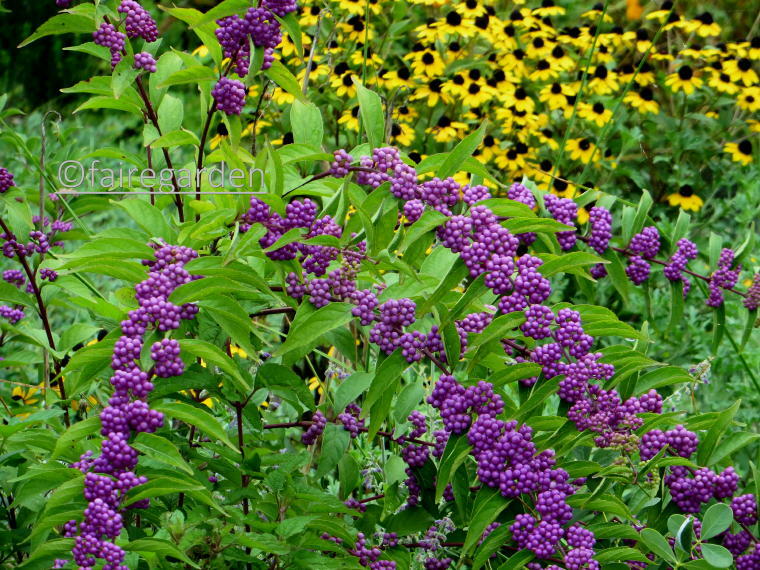 Purple is the perfect color of late summer, whether in blooms or berries. 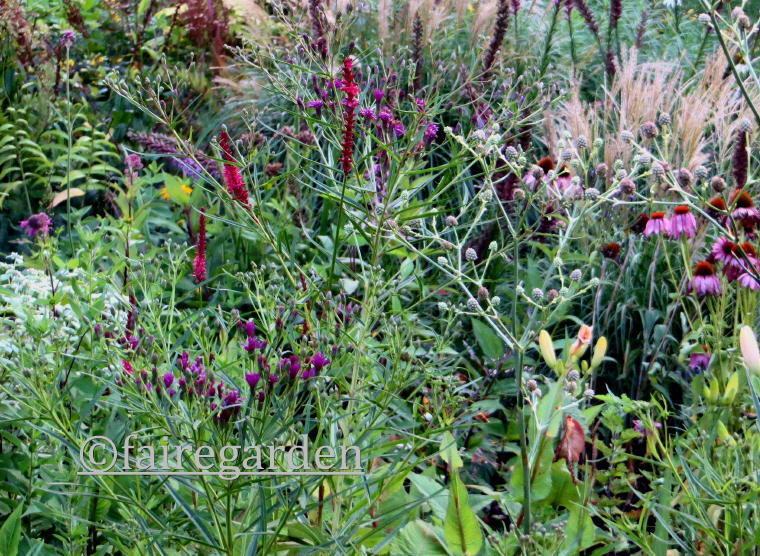 Cuphea ‘Purple Passion’ seeds about haphazardly each year. This placement was fortuitious. 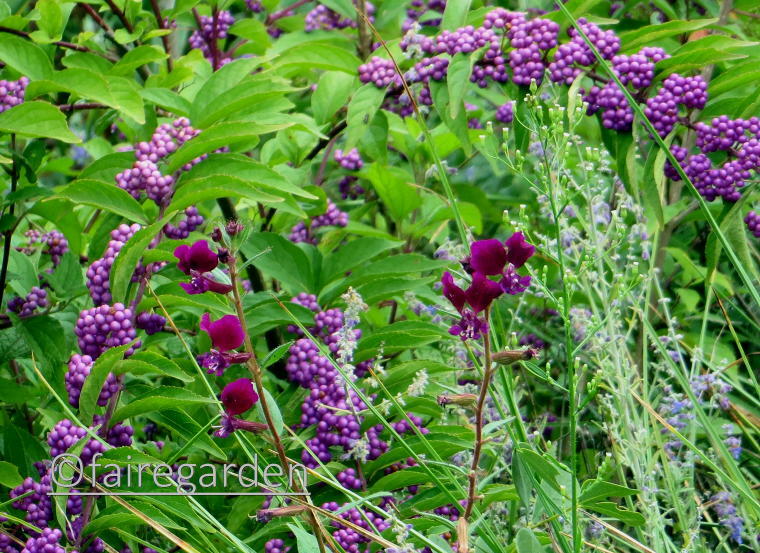 Beautyberry, Callicarpa ‘Early Amethyst’ has grown to a generous enough size to be noticed. 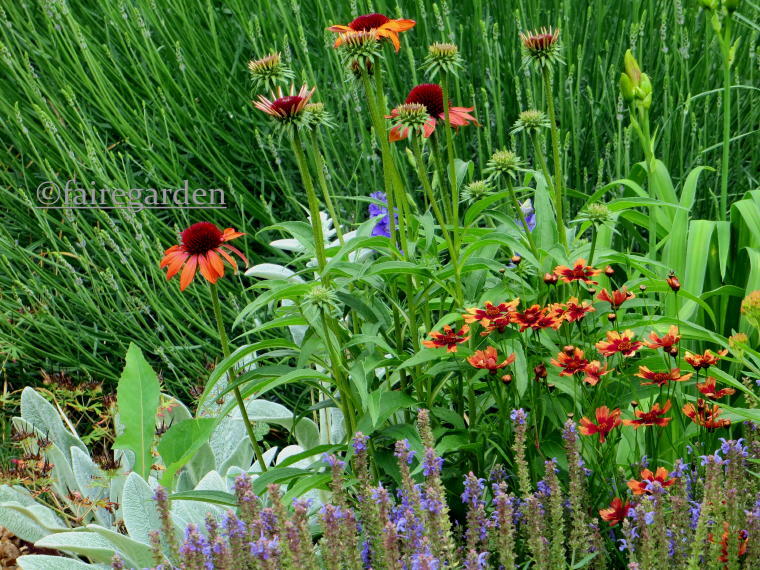 In the background, Rudbeckia triloba offers exuberant complementary color to the cooler hues. 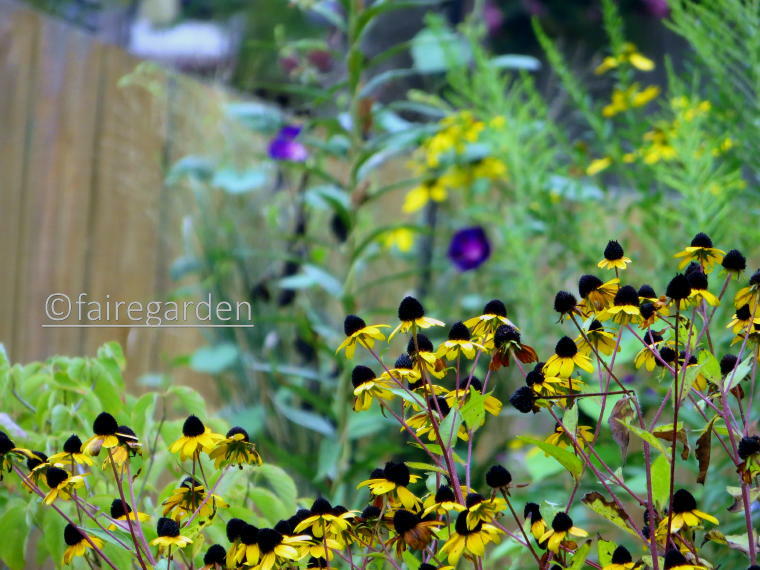 In fact, this avid self sowing biennial Rudbeckia has found a home in nearly every flower bed here. Many seedlings are pulled, some are moved during late winter for better placement. I need to remember how tall they can get and situate them more appropriately in the future. 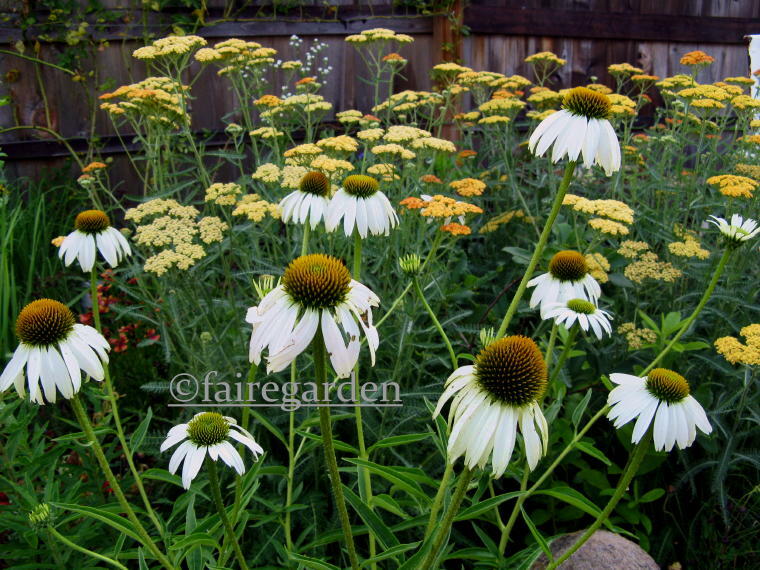 The bright yellow petals with neat brown bobble centers do play well with others. The same cannot be said for the vigorous blue blob seen in the background. But who can resist the charms of the brilliant blues? 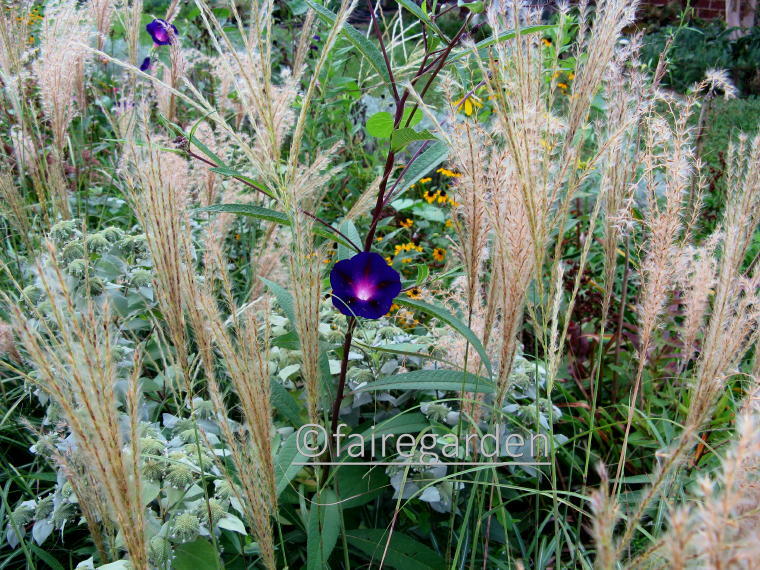 In the lawn/meadow, the boldest and strongest plants, such as Miscanthus ‘Adagio’ , thuggish mountain mint, Pycnanthemum muticum and the supporting stems of ironweed, Vernonia gigantea can withstand the winding, willful vines of morning glory, Ipomoea sp. 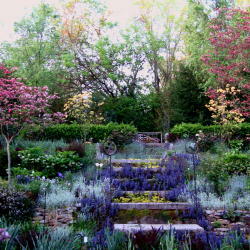 Lesser perennials will be brought down in a tumble and even shrubs can be suffocated in heart shaped leaves. The gardener needs to maintain watchful vigilance to protect the weak. 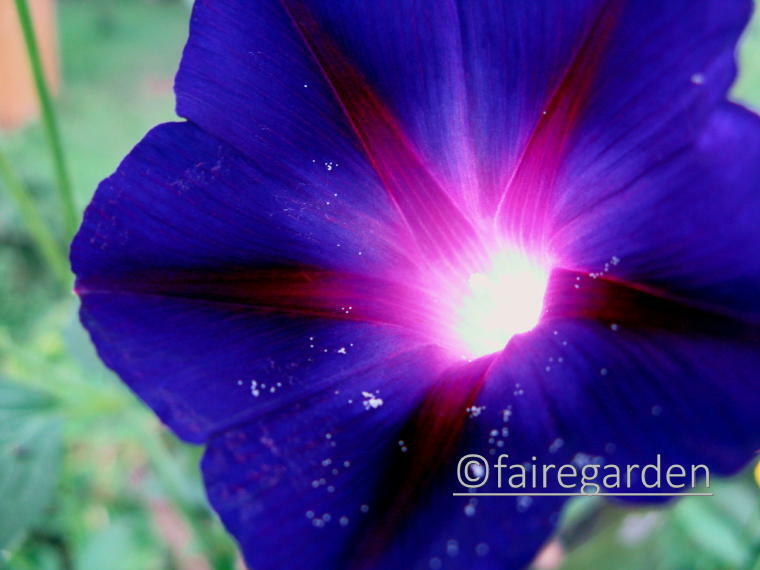 If ever there was doubt of the magic that exists in the realm of nature, proof can be found in the simple flower of morning glories. Lit from within, perhaps there is a fairy party going on inside. Maybe the answer to the meaning of life, the universe and everything resides down the funnel of white pollen? 42, you say? I am open to all possibilities. Never let it be said that color is not a primary factor in the selection of plants grown in the Fairegarden. 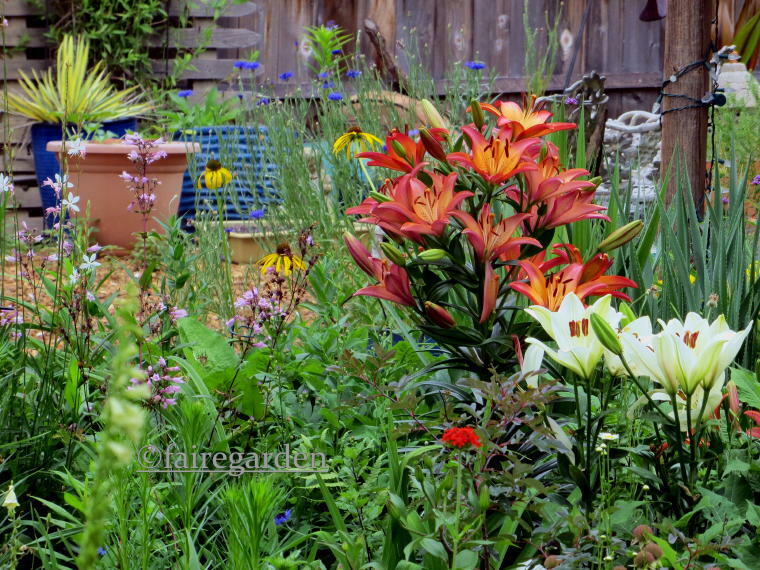 I love color in the garden, all colors, all together, all of the time. There is no such thing as too much color. Color is life, color is…okay, you get the idea. 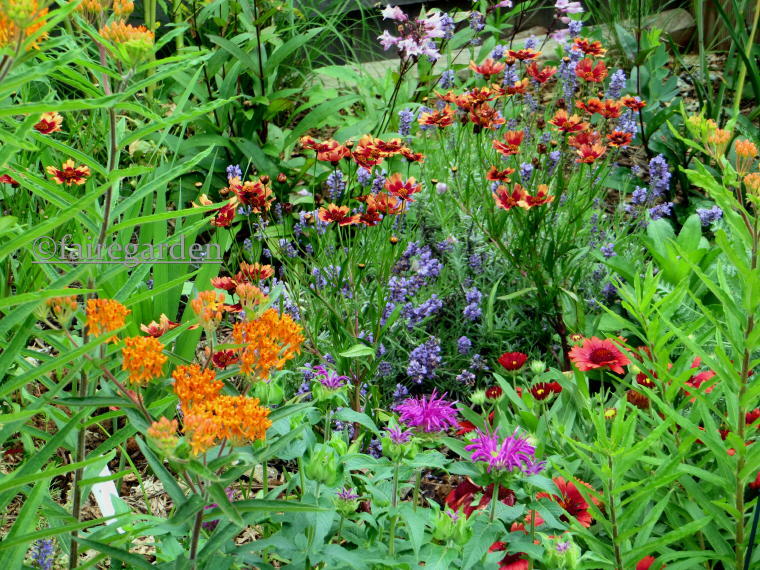 There is more to consider when trying to have a garden that pleases the eye than just the brilliant hues of summer flowering plants. Structure and texture add to the visual pleasures, as well. 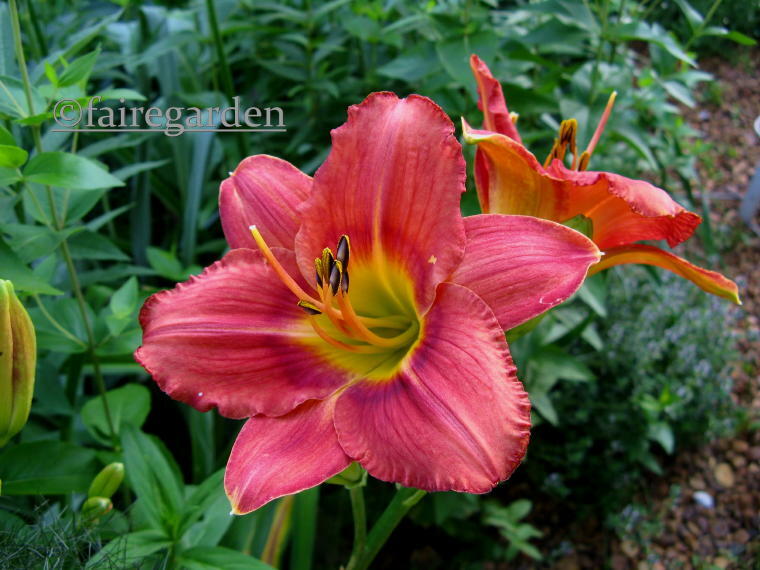 One plant in particular has matured in its third year in the ground, to become a focal point. Its statuesque architecture is stunning. But its color is underwhelming. Maybe that is why capturing the beauty of the bobbles has proven so difficult for this photographer. Or maybe she needs a new camera. Enough with the narrative riddles already. Time for the big reveal… the plant name is a mouthful, and not widely grown. 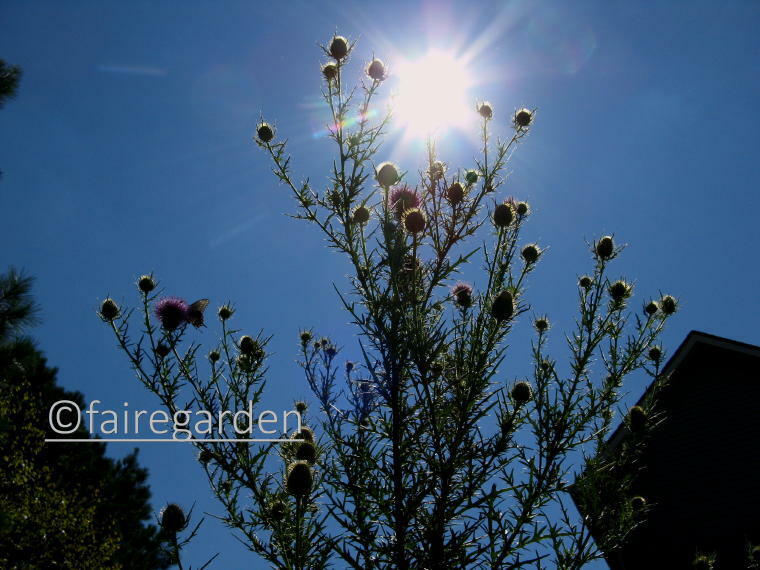 Eryngium pandanifolium was first seen in an article in Gardens Illustrated magazine. 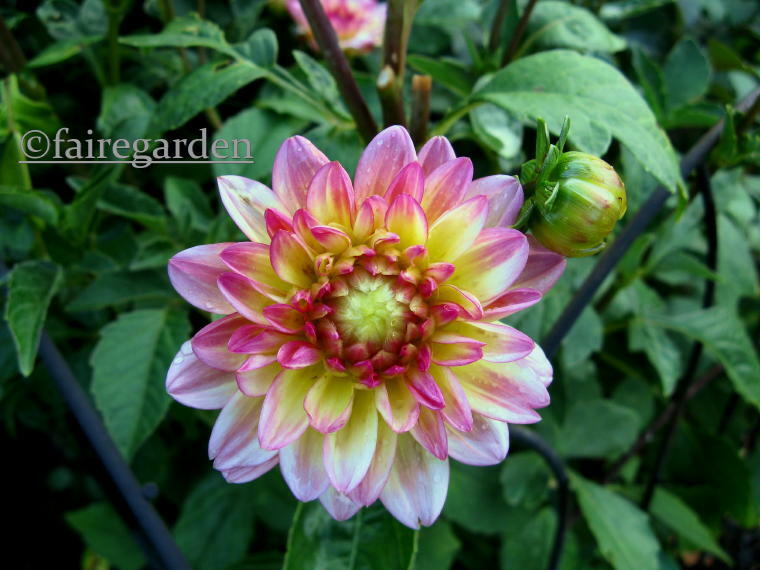 It was noticed in the listings while perusing favorite online nurseries in the search for unusual and must haves. It was an impulse purchase. 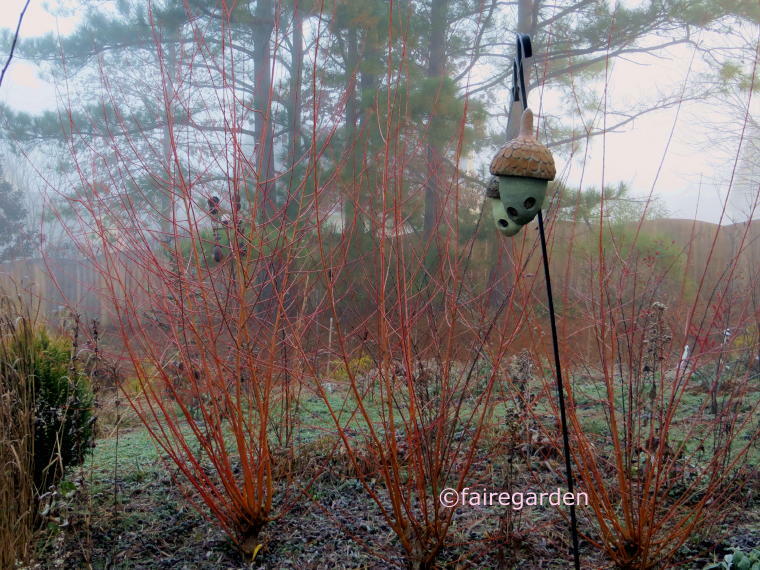 Three pots were ordered from Joy Creek Nursery (link) as winter fell upon east Tennessee. The smart folks at the nursery contacted me saying they would not ship at that time of year unless there was a greenhouse available to keep them until spring. There was, and the large plants were repotted into larger containers, for they are fast growers. The next spring the pots were moved outside but not planted in the ground. We had decided to sell our house to move closer to family. 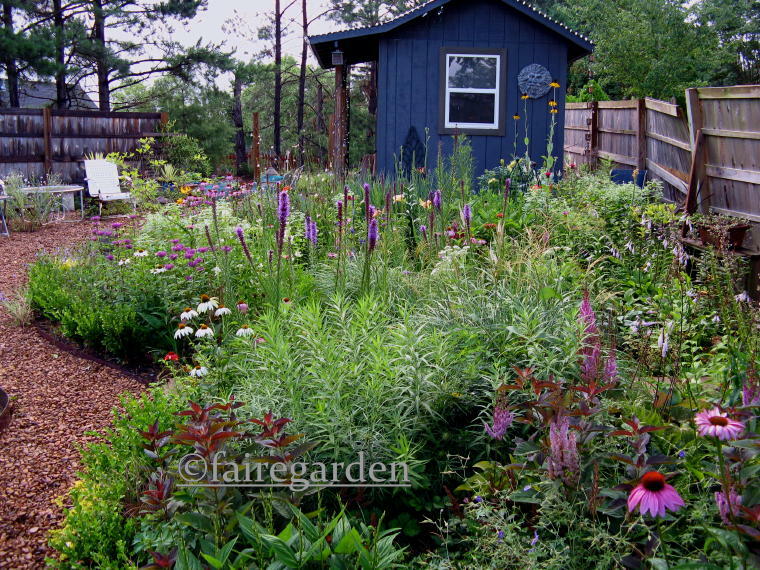 The Eryngiums would be making the move, even though there was no greenhouse at the new house. 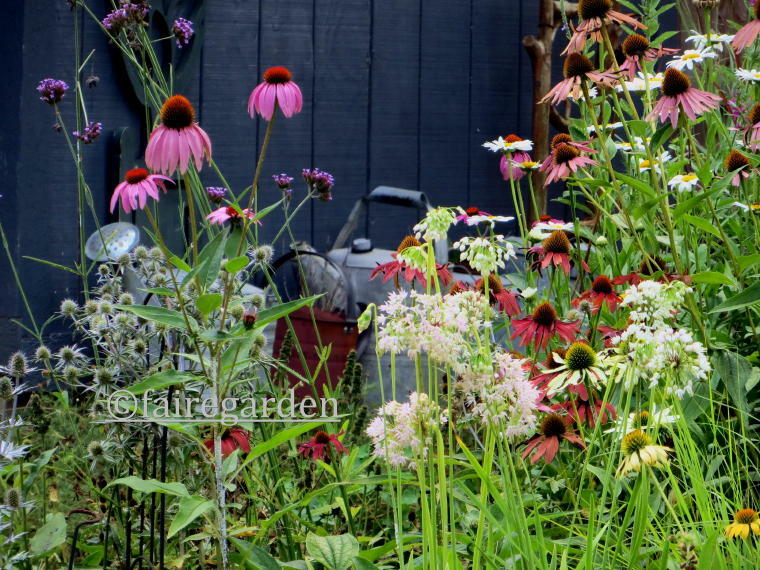 Only hardy to zone 8 or 9, the three bursting at the seams pots were cut away and the plants plopped into the pile of garden soil that was trucked into the new back yard to form the beds. 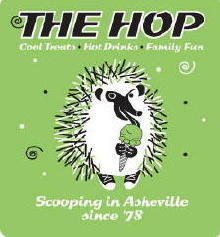 Winter came hard that year, with devastating ice storms and single digit temperatures. Survival was hoped for, but not counted on. Uncertain about the life force remaining within, the mushy leaves were cut back the next spring. Thought was given as to what might replace the large plants, but fate was on our side. New, fresh leaves regrew from the centers, but no flower stalks would arise for another two years. 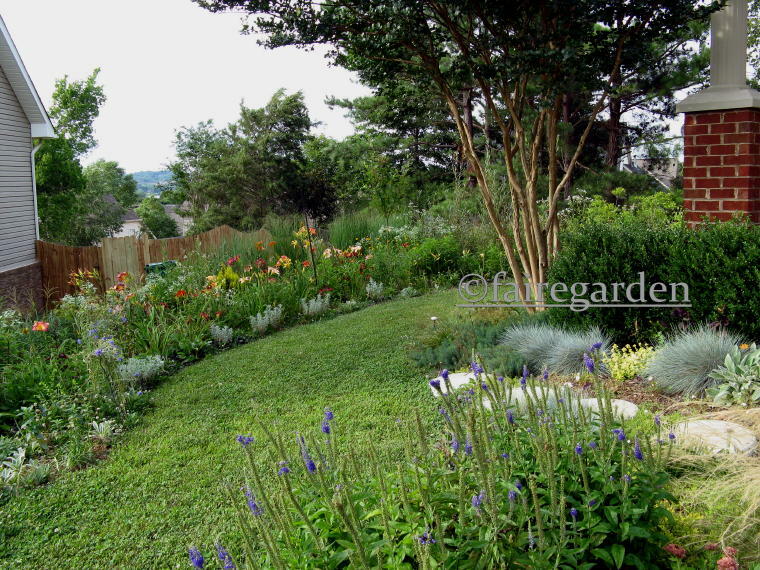 We are solidly USDA Zone 7a, with hot, dry summers and wet, cold winters. The back garden is protected with a (now repaired) fence and the new garden soil is well draining loam. If there comes a winter that spells doom for these spiky, sculptural sentinels, they most likely will not be replaced. However, the tall, stately wands add elegance and whimsy to the messy melange and the evergreen, usually, foliage adds winter interest. They would be missed. By the way, the shed does not function as a greenhouse, as dozens of dead Dahlias will attest. For anyone confused as to which plant in the photos is the subject of this post, it is the tall silvery green stems topped with small balls and sword shaped foliage. Getting a clear portrait image seems impossible. 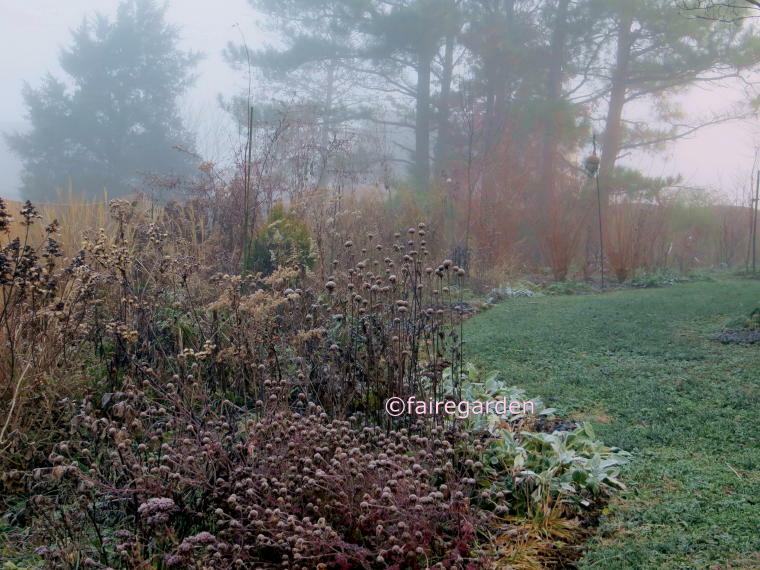 I hope you can pick out the Eryngium pandanifolium in most of the photos. I tried my best. July sees the gardener spending most daylight hours hidden inside with the air conditioning unit running nearly nonstop. 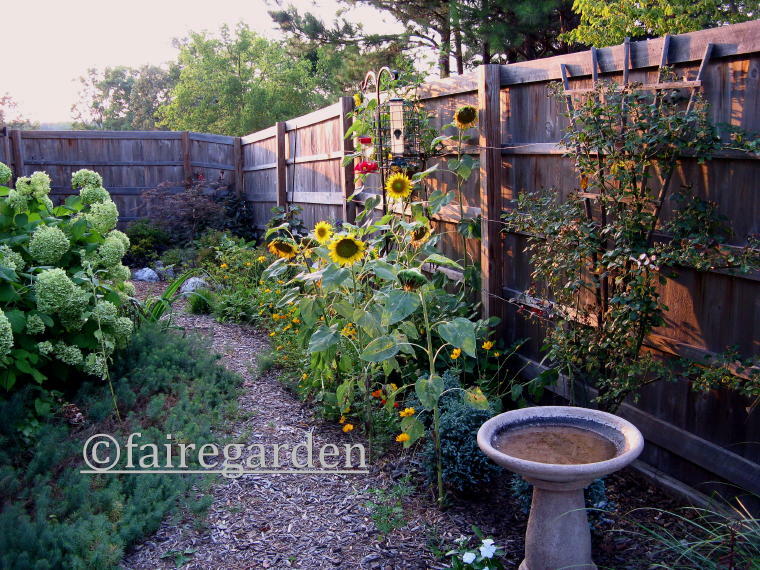 Early morning and well after sunset are the best times to enjoy the garden delights. 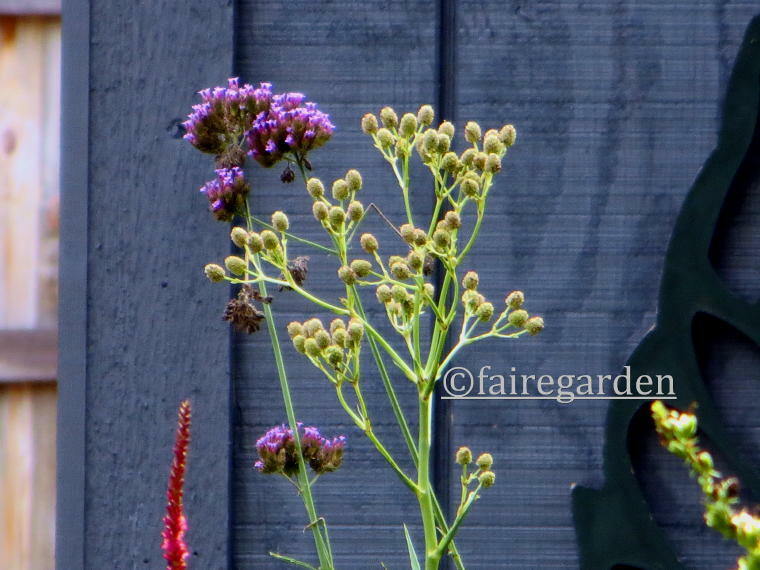 Eryngium pandanifolium is a highlight, among other things. Onward. It’s pretty colorful in the Fairegarden during May. 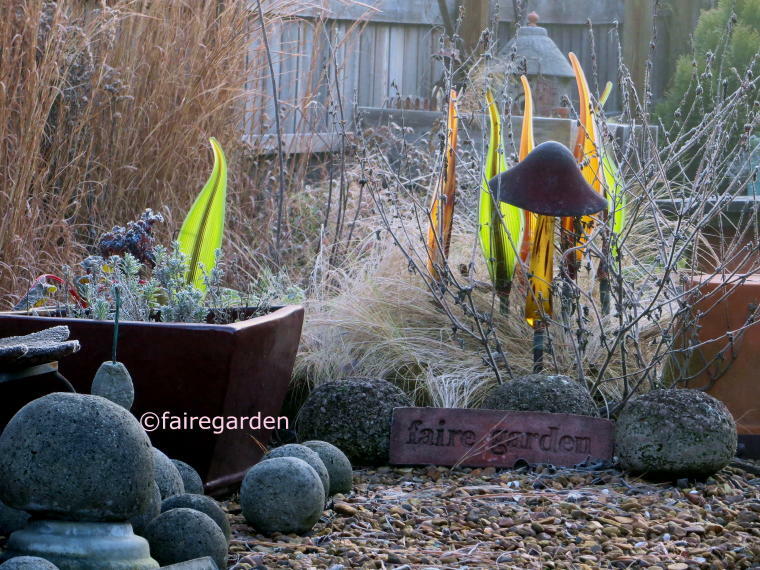 The cool shades of early spring are grateful for the addition of warmer tones as the weather heats up. 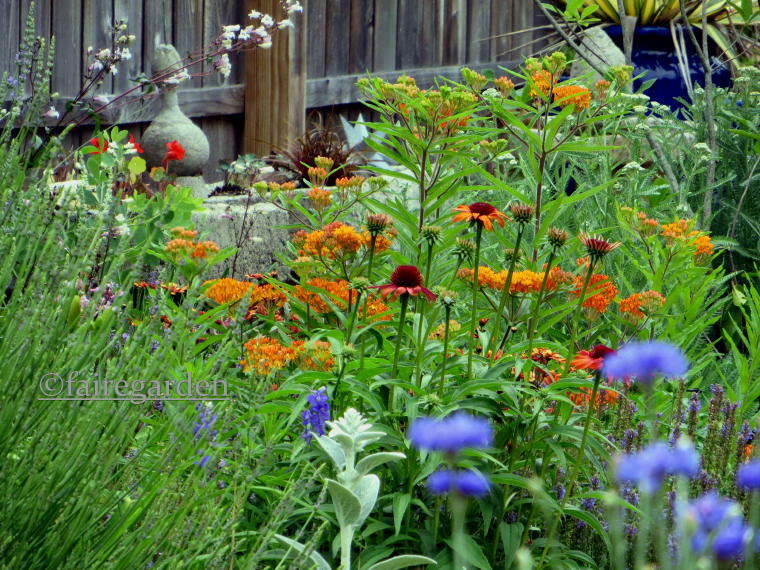 Orange is the debutante of the hour, represented well by butterfly weed, Asclepias tuberosa. Finding just the right supporting cast has been years in the making. It was part brilliant epiphany but mostly accidental plant plopping that created the perfect blend that lets all the players show their finery. The lilies have taken the stage, as well. 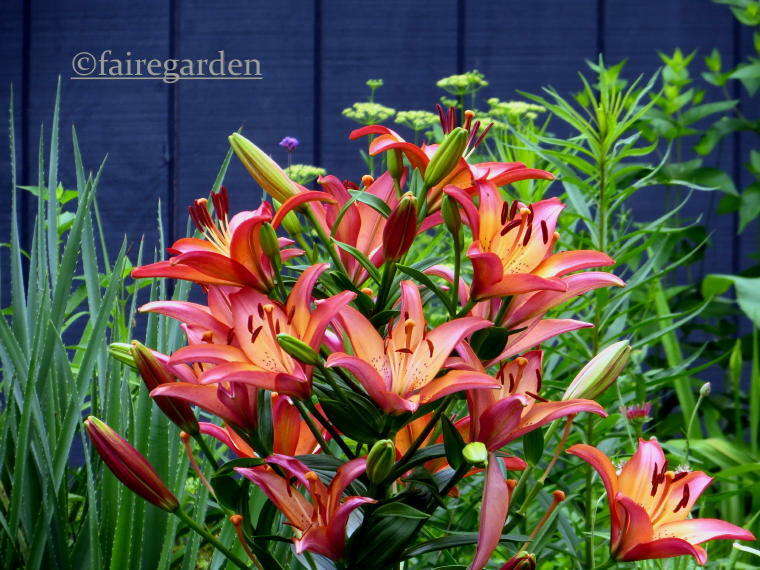 Queen of the moment is the longifolium asiatic hybrid, Lilium ‘Royal Sunset’. 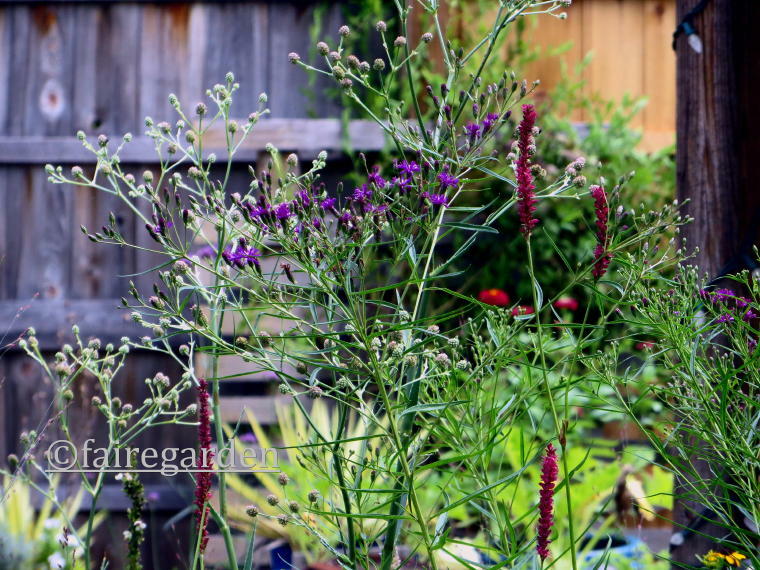 A stout stalk can hold the numerous flowers high and proud without the need for staking. The combination of melon centers with hot pink edges might sound garish to those with delicate sensibilities, but the light fragrance and dusting of dark freckles should charm the white gloves right off of even the snobbiest colorists. 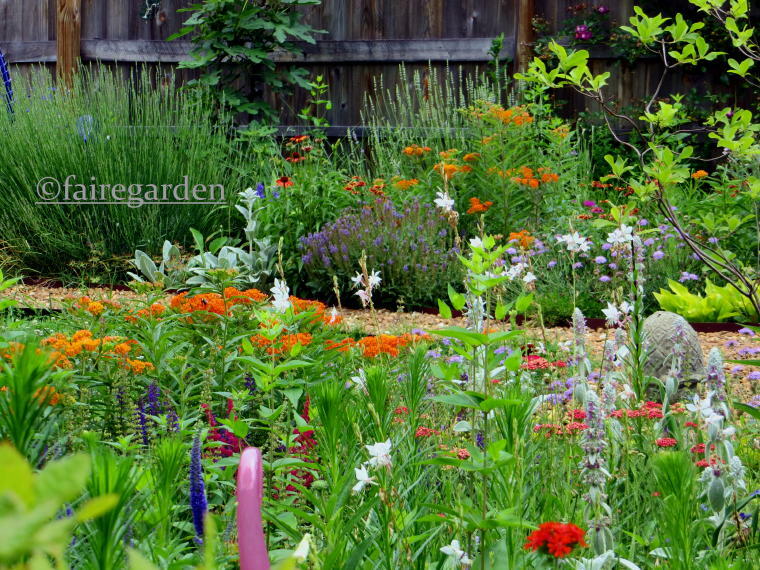 When confronted with blaring colors, the best and easiest path to garden delight is to simply add more. 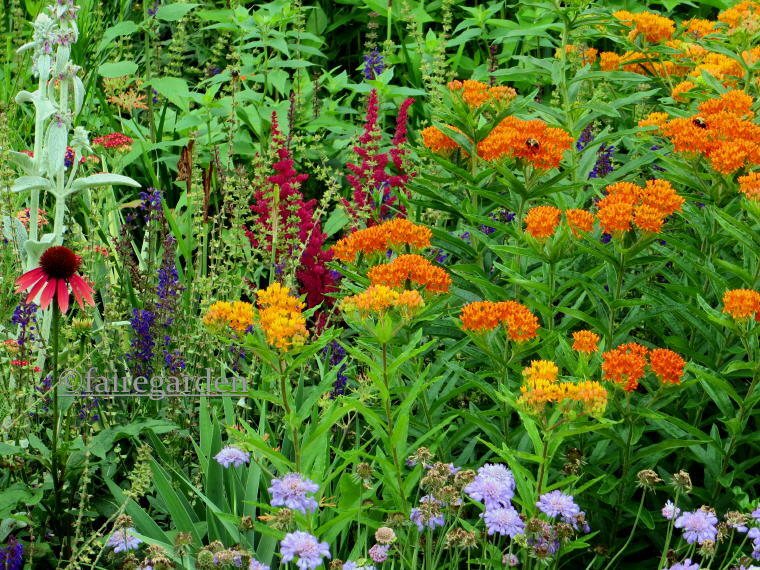 The reddish Achillea ‘Paprika’, Astilbe ‘Fanal‘, silver and purple lamb’s ear, Stachys byzantina and various blue Salvias help make the back garden beds a fun feast. 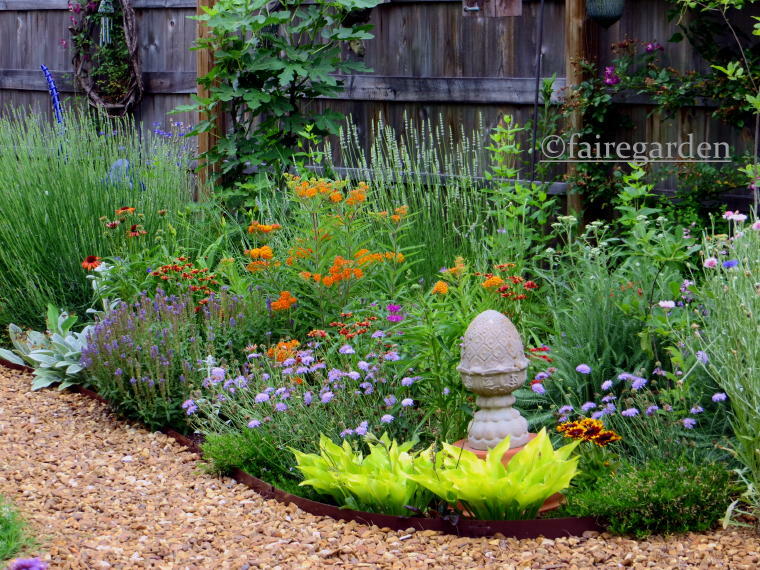 The gravel path dissects what is meant to be matching, sort of, plantings on either side. 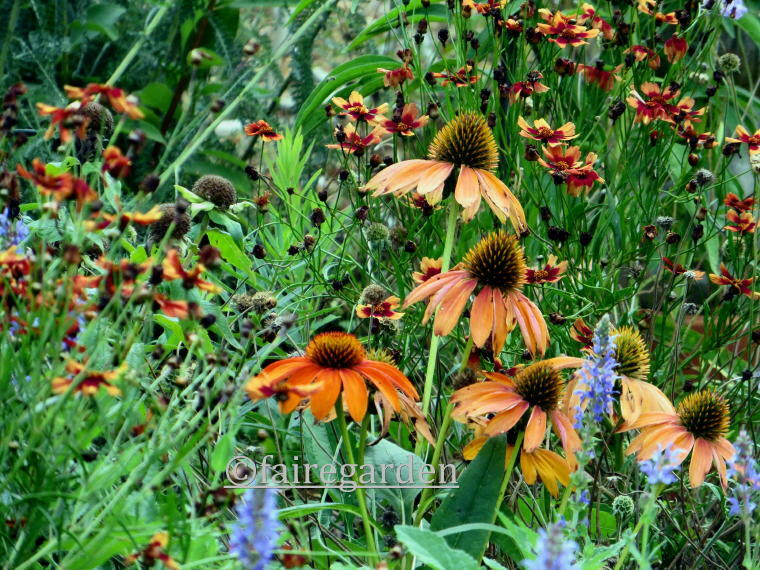 Oranges, reds and yellows, complemented by blues, whites and purples bring happy smiles from pollinators, critters and humans. We’re all in this together. The hosta is H. ‘Sunpower’. 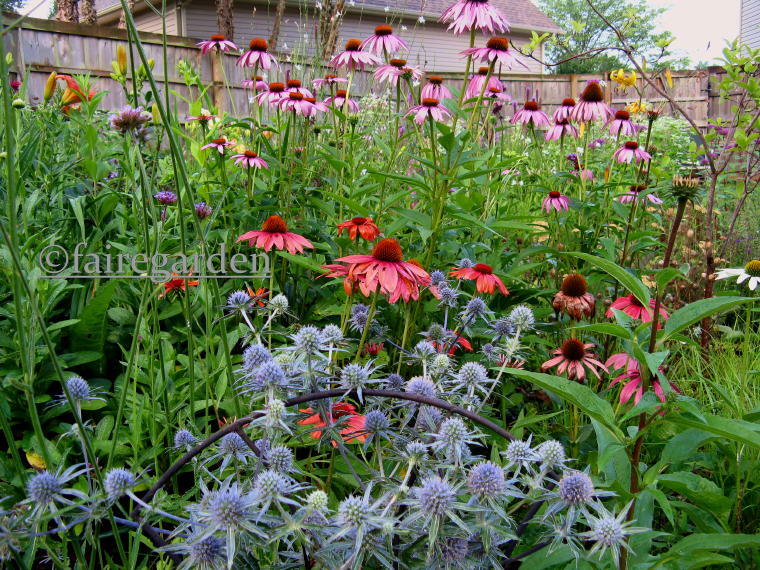 The variable colors of Echinacea ‘Prairie Spirit’ have been a blessing. 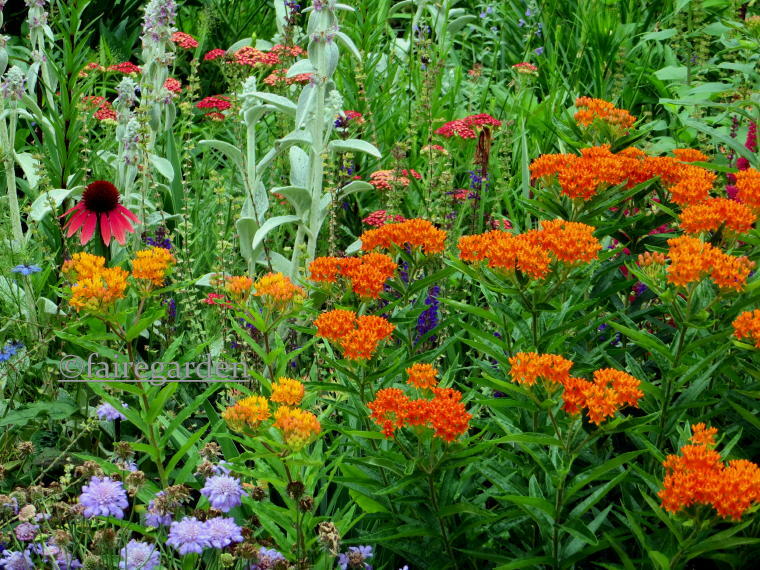 I only buy them in bloom to be able to select the darker reds and oranges as companions to the butterfly weed. Later in the season, those colors will continue to enhance the daylily and daisy shadow and blush as lipstick finishes a model’s makeup. Coreopsis Hardy Jewel Series ‘Desert Coral’ is new this year. The color could not be resisted. I hope it performs over several years, at least. It’s a rainbow out there, at ground level rather than in the sky. Nature will make changes to the painting over time. The gardener throws the pigments onto the canvas with a hopeful twinkle in her eye, waiting to see the vision become the masterpiece, however it turns out. In this, our third year in the new house, both the humans and the garden are getting settled in. It feels like home. 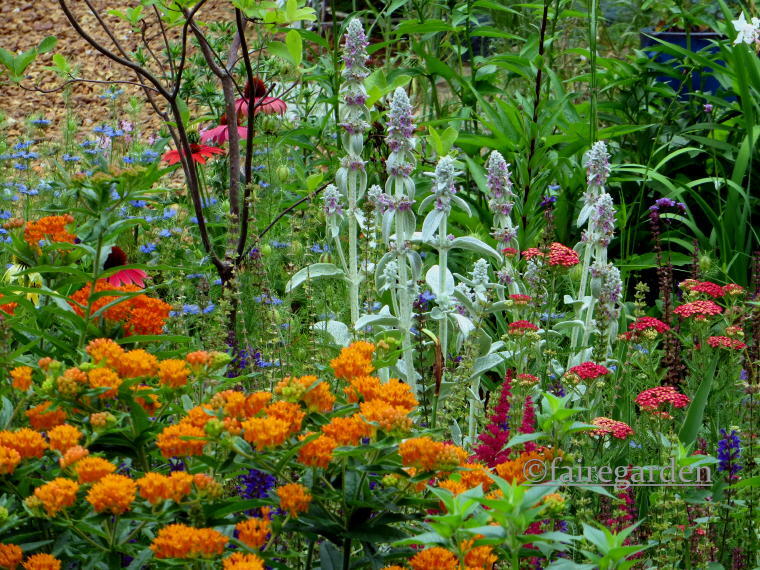 Plants that were brought with us, some of them, have done very well, enough to be divided and spread about. 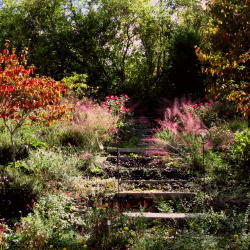 Among those is Spiraea ‘Magic Carpet’. It was selected for the Asian Garden that is located in the oddly shaped back corner inside the fence. Hyacinthoides hispanica ‘Excelsior’ planted around the granite koi bowl birdbath complements the shrub’s colorful foliage. This area is the view from our dining room window. It is especially pleasing at the moment. Evergreen azaleas were chosen for the fresh, dark green leaves and flowers of red and white. Rhododendron ‘Snow White’ is the first to open. I do adore white flowers, they allow their neighbors to shine brighter. I read that Asian gardens use red flowers rather than white, which is more often used in memorials. That’s okay, I have never been a traditionalist. 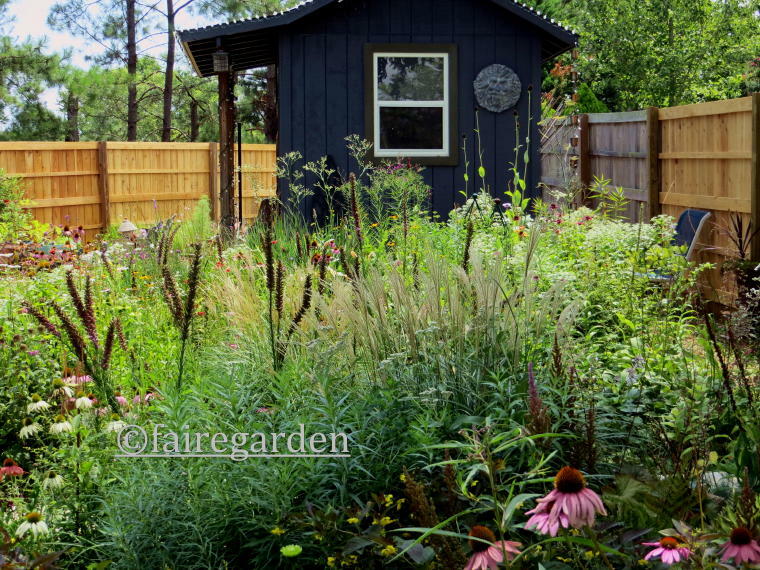 The main garden beds within the fenced back yard include the nursery, and the lower nursery. 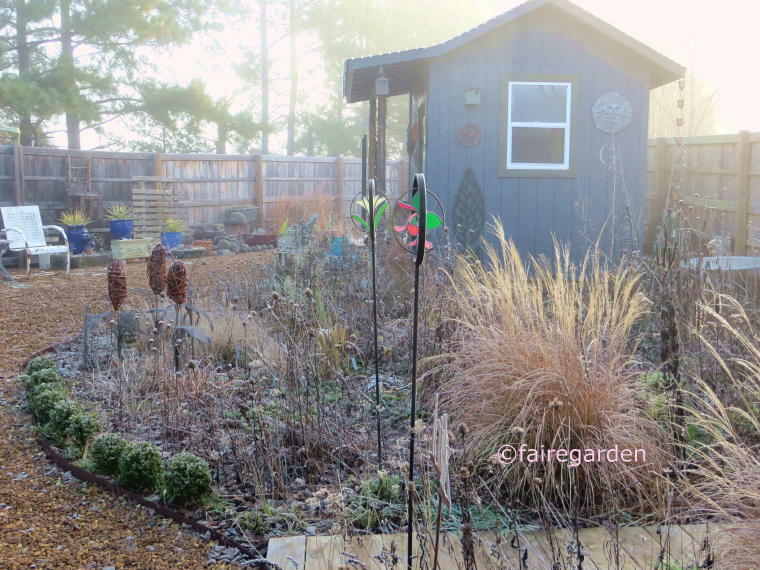 The nursery was formed when a dump truck carrying six yards of planting mix deposited the precious stuff in a large pile in the crabgrass lawn in August of 2014. Plants potted and those simply tossed into black plastic trash bags were planted into the smoothed out pile. Included in those were the yellow flowering Primula veris, grown from seed in the old greenhouse and Phlox divaricata that was tagged Blue Moon. It is closer to white than blue, but it came from Walmart so you take what you get. It’s still pretty. Polygonum odoratum ‘Variegata’ was one of many plants shared with us by neighbors Mae and Mickey after we had moved into the old house we originally bought for our daughters to live in while they attended college. Let’s just say that we were welcomed with open arms as residents after the girls moved on with their lives and the house was renovated several times. The garden also improved. We moved to the current house from there. 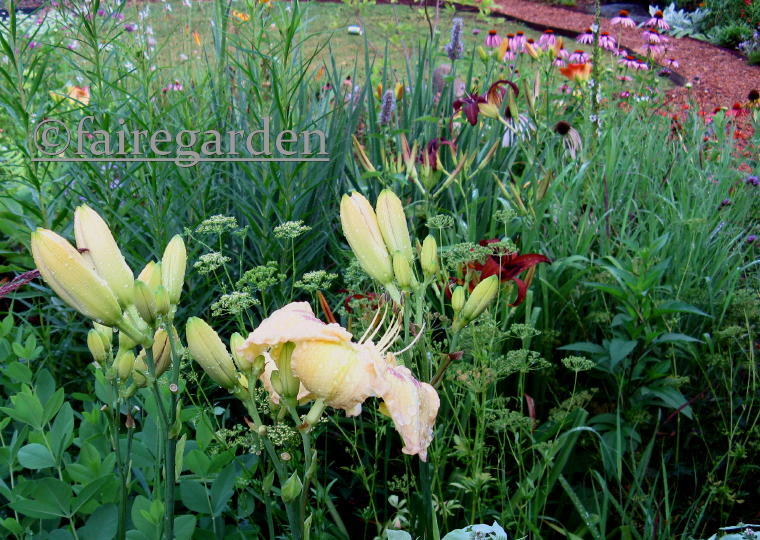 Many seeds were scatted into the new beds, including various Aquilegia ssp. This little one looks like a descendant of A. ‘Magpie’, which has proven to have very dominant genes. 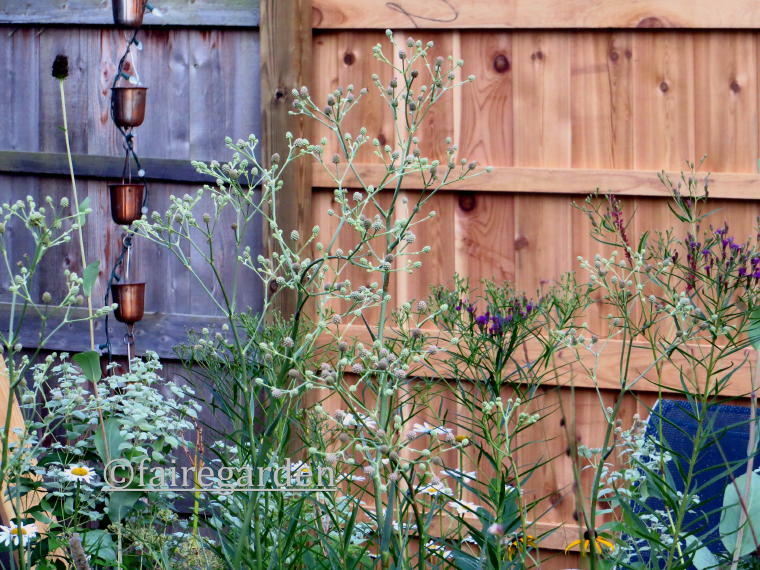 Last year Gardoctor built a wooden walkway to replace the trio of rotting bench tops that had been spread between the upper and lower nurseries to provide a dry tootsie means of transport. It looks quite nice and is much appreciated, thank you, dear son. Hydrangea quercifolia ‘Little Honey’ has made itself at home in the shady environs of the lower nursery. 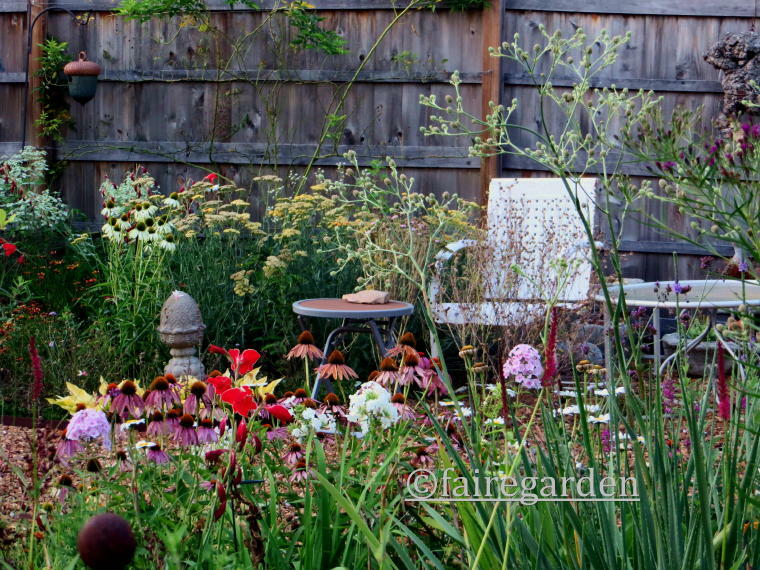 Ferns, geraniums, ajuga, among many others, are filling in the space and make a colorful, contrasting chaos. Little Honey is really a fine shrub. It needs partial to full shade and enough moisture to keep the roots from going bone dry. Highly recommended. In the distance is a budded but not blooming yet Baptisia alba and a sunny swath of Salvia ‘May Night’ in the upper nursery. 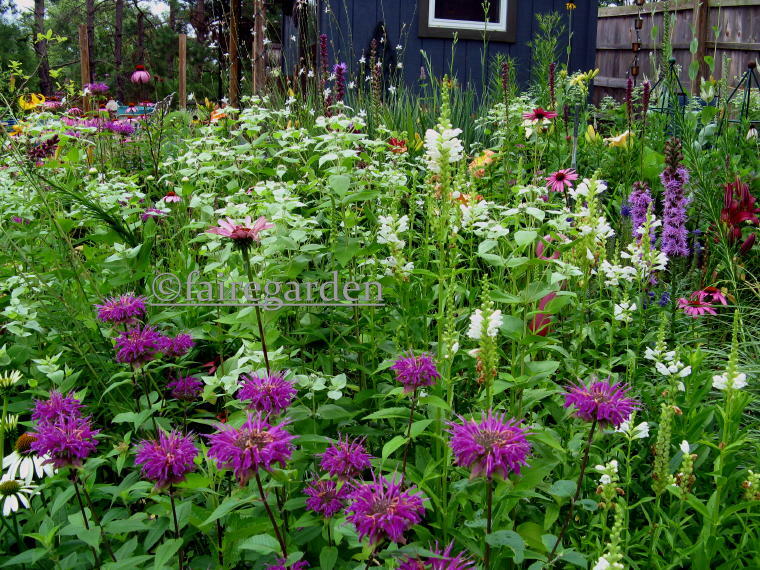 Here are more seed grown columbines, Aquilegia ssp. with a new native azalea. Three unnamed seedlings were purchased at the University of Tennessee Arboretum spring plant sale in 2016. So far, none of these types of azaleas, which grew to perfection at the old garden, are what I would call thriving. The soil is less acidic here and summers have been droughty. I am giving them extra water and have gone so far as to plant a couple in large containers to see if that helps. I won’t give them up without a fight. Figuring out the best times to take photos here has been a challenge. Too much light, not enough light, no slope to get that exquisite backlighting, too tired, too hungry, nothing looks good, maybe I need a new camera (or new body to do contortions on the ground) have dampened my image capturing enthusiasm. 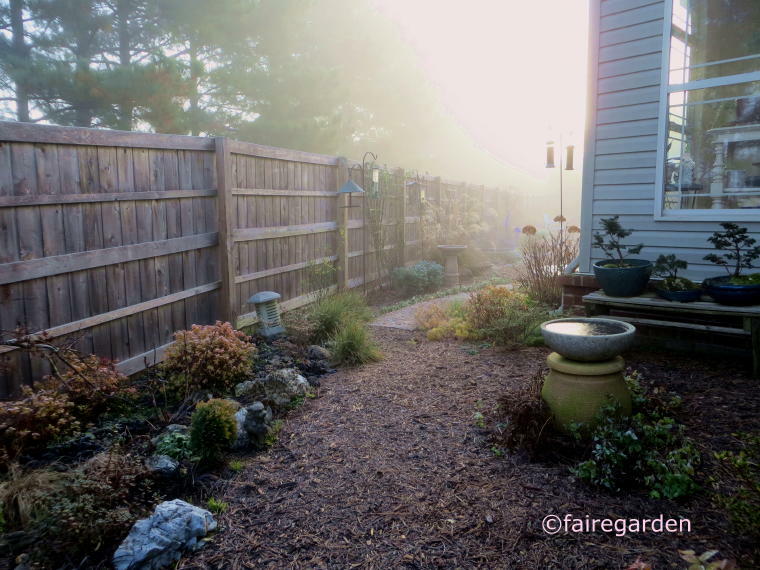 I still love to garden, though, and still love to try and share the beauty of it through blogging. Buds just ready to burst, like these chives are still one of my favorite subjects. Kitty remains ever helful, snoozing on top of emerging flowers and foliage. He especially likes to pretend he is on the Savannah in tall grasses and has done a number on a stand of Carex ‘Red Rooster’ in the lower nursery, jumping and kicking imaginary interlopers. I like having him around. Onward.